Early in the 35th Millennium, the High Lords of Terra issued an inordinate number of decrees to expand the Imperium and settle upon uninhabited worlds. The exact reason for this is unclear, though many Imperial scholars point to the Ur-Council of Nova Terra in opposition of the High Lords of Terra as a potential cause. With so much territory lost in such a short time, bitterly fought over in a bloody civil war, the High Lords perhaps looked to untapped locales for much needed resources. In 328.M35, hundreds of settler fleets gathered to depart for a region of space that Imperial records state never had a human presence. Existing below the galactic plane, separated from the galaxy yet close enough to make Warp travel to it theoretically possible, was a cluster of stars, like a dense, miniature galaxy orbiting our own, akin to a satellite moon. Some thought its distance from the horrors of the galaxy would see it free of its worries and troubles, free for humanity to flourish unopposed. With such thoughts in mind, this galactic satellite was dubbed the Liber Cluster. 16 million settlers left for the Liber Cluster in over a dozen waves through a period of two centuries. 16 million human souls, to map hundreds of millions of suns, to catalog billions of worlds, but most importantly to settle upon the 350 worlds theorized by Mechanicum logic-tenders to be habitable within the Cluster. The sheer number of ships needed dwarfed any other fleet of such singular purpose, a size not seen since the heady days of the Great Crusade. Reports came with slowing regularity, as the dispersal and distance made it difficult to keep in contact. The reports painted a grim picture, for the Liber Cluster was not all that the Imperials had hoped it to be. Though accompanied by Imperial Guard regiments escorted by the battleships of the Imperial Navy, military resources the High Lords found difficult to part with, initial contact with the Cluster encountered a strong Ork presence, which stunted the first few waves of settlers. It took sixty years of grievous losses before the human forces could consolidate their beachhead into the Cluster, declare territory for settlement and conduct deeper explorations. It was discovered that where they had entered the Cluster, deemed the best location for its closest proximity to the nearest Imperial muster world, was dead center in a budding Ork kingdom. Though its back was broken, the Ork menace remained at large throughout the Cluster, making progress difficult. They were also not the only xenos threat within the Cluster. Mysterious disappearances and crippling attacks as if from ghosts forced the human settlers to shift their paths of progression on more than one occasion. Though very little evidence of these attacks was left by the aliens, the patterns fit with known Eldar engagements. Other xeno breeds plagued the Cluster, many of which new and unknown to the greater Imperium. Not all were advanced enough to pose an existential threat to the human settlers, but enough were to prevent them from expanding into all corners of the Cluster. The Warp was unusually calm within the Cluster, with no known Warp-borne aberrations witnessed after an entire century, a level of calm not seen in any other Imperial Sector of comparable size. While initially seen as a blessing, a sign that the corrupting touch of the Warp was too weak here to threaten them, it proved instead only to be the calm before the storm. The last known report was received 527.M35. After nearly a decade of silence, the next scheduled settlement fleet had much of its civilian population replaced with Guard personnel. Embarking for the Liber Cluster in 514.M35, it kept in regular contact with the Imperium in its decade-long journey. With the Terminus Crux station missing, its first stop was at Liber Primus, the first settled word of the Liber Cluster and headquarters to its human population. Their hails went unanswered, and radiation readings showed the world was too hot for even an unmanned probe. This finding, along with a declaration of intent to explore unknown readings from the uninhabited gas giant of Liber Septimus, was the last transmission received by the Imperium. The High Lords who reigned at that time were not the same who had so fervently endorsed the settlement of the Liber Cluster. When no further transmissions were received, all details of the Liber Cluster and humanity’s ill-fated attempt at conquering it were swept under the rug and forgotten. For four centuries, the Liber Cluster was dark. No further attempts were made to enter its depths, and nothing from those already lost to it was heard from again. But the Imperium has ever been a mercurial beast, led by High Lords of distinction and infamy. So it was that when a particularly ambitious, daring Council reigned in the final century of the 35th Millennium a great many changes would occur, and old, failed projects dusted off and renewed. The most ambitious of these projects was a Founding of Space Marines. The twenty-first of its kind, and greater in size than any before it save the legendary 2nd Founding. In large part due to its size, a great many other projects were included in this Founding, namely experimentations based upon uncovered relics of gene-tech. Thanks to the inquisitive and studious High Lord Jahleirr Sultin, master of the Administratum and obsessive collector of ancient documents, a small portion of the Founding was earmarked for a return to the Liber Cluster. Over a dozen newborn Chapters of the Adeptus Astartes would not be subjected to the genetic experimentations common to this particular Founding, but would instead be tasked with more effectively taking the distant Cluster in the name of the Emperor. Hello, and welcome to the Liber Cluster community project. This project is about building from scratch an entire Imperial Sector, with the twist being that it is a distant, isolated globular cluster of densely packed stars orbiting the Milky Way galaxy. Anything can go into here, from Chapters of the Adeptus Astartes, to regiments of the Emperor’s stoic Imperial Guard, from Sisterhoods to Knight Houses, from Forge Worlds to Death Worlds. Anyone can contribute on anything within the Liber Cluster. Whether it's lore, artwork or creative writing. Multiple people can even contribute on the same specific matters. Remember to be considerate if, for instance, you and another are working on something at the same time, whether it be an Imperial world or a Warband of Traitor Marines. All normal board rules still apply. We can speak of, and create, Xenos breeds, but only as antagonists to Humanity. Nothing, for instance, from the Xenos perspective or focus. Anyone can contribute to anything, so long as it is new material. No volunteering old work, no making cosmetic changes to fit it in. Anyone can provide comments or criticism, so long as it is constructive and considerate. Everyone is an equal contributor. Any contribution provided to the Liber Cluster community project is the community’s and not the individual’s. Please bear this in mind before contributing. I, Cormac Airt, will for some bloody insane reason be heading this project, at least for the time being. But, I am only here to guide and not to dictate. You don’t need my approval to be a part of anything, nor does any contribution have to go through me before it can be considered truly a part of the project. I will provide the structure and the goal posts to help the project be further fleshed out. I will step in and settle disputes where necessary. However, I will also be contributing myself, as time and inspiration permits. To make sure that there is no mix-up between myself contributing as an equal to the rest of you, and to myself acting to safeguard this project and keep it moving, I will change my font accordingly. If you see something of mine in this font, then you know that whatever it is, goes. Whether it is putting down a disagreement or putting the thread back on track. If anyone feels that I have become tyrannical with this power, they can to turn to the Moderati of this subforum (Aquilanus, Messor and Olisredan), who are the true law in these here parts, whatever my choice of font color. If somebody else takes over in heading the project, then the same thing here goes for them as well. To get the ball rolling, I have laid something of a framework around which others can add onto, or affect and change around a bit, in the second post, which will be edited extensively over time to include newer developments. Remember the golden rule of being considerate, so if there is something that you wish to change, whether it is something I provided or another contributor, start a discussion on it rather than simply making that change. Perhaps some thoughts can be swayed, or a happy middle reached. This isn’t Minecraft, so no going around planting TNT in other people’s houses. Edited by Conn Eremon, 31 January 2015 - 08:31 AM. c. 188.M36 - The Reign of Blood begins. The area where the Imperium of Man first planted the Aquila within the Liber Cluster and once the most heavily populated Sector in the Cluster. 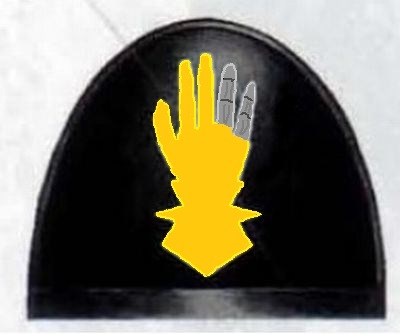 It remains the Cluster’s seat of power for the Imperials, centered upon Libera Mundi. Libera Mundi – The seat of the Administratum Master, essentially the ruler of the Liber Cluster. One of it's moons has been converted by Mechanicum detachments to become a port, repair station and shipyard. The Senatorum Liberum - A senate loosely based on the example of the High Lords of Terra, wherein representatives of the Liber Cluster's most important factions meet and offer counsel. Ruled by the Administratum Master. Terminus Crux – An ancient, abandoned space station now owned by the Ecclesiarchy. The Seat of the Liber Cardinal, Terminus Crux is a site of frequent pilgrimage for the faithful. Saneslau System – Home to the Saneslau Mechanicum, the foremost representatives of the Adeptus Mechanicus in the Liber Cluster. The system contains three Forge Worlds, an Agri-world and a collection of shipyards. Nabaretti – Large Hive World orbiting a star on the furthest edge of the Liber Cluster, with a population of 50 billion. This Hive World has produced over 800 active regiments. Velmghart - Sister world to Nabaretti, whose population mostly live in a single gargantuan Hive Spire. Rumours of a Tzeentchian Cult on the world persist. Carver’s World – Quite Arguably the Merchant Capital of the Liber Cluster, Carver's World is indisputably a key link in over 90% of trade between the Liber Cluster and the wider Imperium. Pellucid – Home World of the Lords Inviolate Chapter. Composed of immense, bowl-shaped continents and endangered megafauna. Maccar – Asteroid covered in many shrines dedicated to Mankind, believed to be one of the earliest holdings of the Imperium within the Liber Cluster. Granted to the Void Jumpers as a retirement world. Gardenhome – Classified as a pleasure world, Gardenhome is deliberately kept pristine by a host of Magos Biologis. The Liber Cluster's ruling classes keep immense, ornate mansions on this world. Vorden - A former Adeptus Arbites training world that came to rule over its neighbors, cybernetic implants are very common in its inhabitants. Hatake - An ice world controlled by ganger-aristocrats and their shadowy warrior-clans, the Rusk. Many Imperial Guard regiments are raised from Hatake, specifically the Rusk. Comprising the very core of the Liber Cluster, this Subsector’s volatile, tightly packed collection of stars makes it the least populated Subsector within the Cluster, in spite of it having the highest concentration of stars. Nevertheless, the incredible wealth of rare minerals, spatial and sometimes temporal phenomena, and the near constant bending and sometimes breaking of commonly held laws of reality means that in spite of its dangers this Subsector does see its fair share of traffic. The Tempest – Warpstorm of immense proportions on the very outskirts of the Cluster’s thickly packed core, swallowing even the would-be Shrineworld of Mabinos, gravesite of the venerated Warmaster, Wilym Mabinos, Hero of the Reclamation and would-be Patron Saint of the Liber Cluster. Many attempts have been made by the Imperium to contain the evil within, but to no avail. A splinter force of Mankind’s most hated, terrible foe dwells deep within, eying the Cluster with baleful hunger and wicked glee. The Soul Reaper System – Collection of planetary systems on the outskirts of the Tempest and one of the last to be reclaimed by the Imperium, with many colonize-able worlds. The system contains many large fields of debris between its worlds and stars, sole evidence of ancient orbital battles fought before the Silence, and more recently when the Reclamation Fleets encountered strong Eldar resistance to the Imperium’s return. Besaine - Designated CB3-10, Soul Reaper System. Maiden world. Aquila Rise - Designated CB1-1, Soul Reaper System. Ecclesiarchal world. Sandbox - Designated CB-4, Soul Reaper System. Mining World. Raw materials are sent to CB1-3 for use. [Unnamed] - Designated CB1-3, Soul Reaper System. Shipyards and dry docks orbit the planet. [Unnamed] - Designated CB2-5, Soul Reaper System. Agri world. [Unnamed] - Designated CB3-6, Soul Reaper System. Agri world. [Unnamed] - Designated CB2-2, Soul Reaper System. Dead World. Unconfirmed Watch Fortress. Sefaris – This wind-blown planet suffers from wildly shifting atmospheric pressures due to the world’s erratic orbit about its twin suns. However, the industrious Sefarians utilize the torrentious winds to great effect, powering their manufactorums by funneling and concentrating wind currents into the labyrinthine tunnel networks that thread through the factories. It is said by many those within the Mechanicus that it is false to assume that their logical minds have no room for the appreciation of art. There is nothing more beautiful than the song of the winds, endlessly sung in the forges of Sefaris. Krineland – Once believed to be the closest inhabitable world to the Liber Cluster’s centermost point, the relatively unremarkable civilized world took this fact to heart, as a matter of great, and indeed biannual, celebration. The Kriner provide little of value to the greater Imperium, instead being merely acceptably self-sufficient. Not exempt from the tithes, however, this leaves their only true export being manpower to the Emperor’s armies, in the form of mechanized, shock assault regiments. Ever since the colonization of the void colony Es’viener, technically 23 lightyears closer to the commonly accepted central point, Krineland has become increasingly belligerent and hostile in the Centralis Court. Accusations fly with increasing toxicity, and often of questionable accuracy, about the many crimes of the void colony against the peoples of Krineland. Many times Subsector Command has been forced to enforce a ceasefire between the two, though exasperation and intolerance over the situation leaves Krineland’s perceived primacy in the Subsector highly suspect. Aquimarne – A planet dominated by ornate shrines and temples to the Emperor, Aquimarne could almost be considered a paradise world were it not for the abnormally high mutation rate amongst the native population. The cause of these mutations is unknown, but the fact of their existence is often enough to dissuade visiting Imperial Citizens from attempting to start new lives on the Shrine World. Mutants are mostly persecuted, and excluded from entry into most cities in Aquimarne, forced to survive in the deep forests. However, the temple-city of St. Myrta's Grace is known to open it's gates to any being with a love for The Emperor in it's heart. On the rare occasions that the mutant tribes give birth to a pure human child, the infant is invariably delivered to St Myrta's Grace and raised by the devout to join the local ecclesiarchy. Kakasis – Agri-world subsumed by the Tempest, now put to infernal use supporting the vast cult hordes that are all that remained behind of the Imperial population, among others who have made a home within the Tempest. Rictus IV – Acted as provisional capital for the Subsector during the reclamation process. Its status was eventually supplanted by the return of Colvin Majoris, former capital of the region. However, during the war against the Colvin secessionists, Rictus IV was one of the few worlds to remain under Imperial control. As such, it was the Imperial HQ for the war efforts, and following its conclusion was able to reclaim its former status as the Subsector capital, now on a permanent basis. Colvin Majoris – Capital of the Colvin Subsector, former home world of one of the Liber Cluster’s most prominent of Imperial dynasties, the Olgevins. Ice world famed for its defenses and as the resting world of one of the Liber Cluster’s greatest saints, Colvin Majoris had its original call to fame during the conquest of the Ghostlands region, where its position is a forward base saw rapid growth and development. When Saint Verdinant returned, the entire Subsector seceded from the Imperium. After centuries of warfare, Imperial forces claimed the Colvin system. However, increasing solar activity forced them to abandon the system. The worlds within are now scoured clean of all life. Colvin Minoris – Former frontier world that acts as a staging area for the Ghostlands conquest. Durant - Once a naval port of call, Durant is now little more than a waystation frequented by mercenaries and scum alike. The mutants that live on the moon of Durant, Charis, are regularly culled or hunted by slavers. They are afforded no rights as citizens of the Liber Cluster. Durant itself is a warren of tunnels and supply caverns, the spaceport serving as more of a settlement these days than an actual military facility. The planet may be small but should you need a hired gun, there is plenty to find here. Following the Colvin secession, this world is placed under very harsh control by the Adeptus Arbites to ensure that a repeat does not occur. Though few mercenary companies will now frequent this world, it remains the place to be to hire them. As the mercenaries themselves left, middlemen and agents remained behind as intermediaries between the mercenaries and potential customers. Drysthelm - Although nominally settled and even supplying a minimal tithe, Dysthelm is a death world that barely manages to support itself. Unusual to many death worlds, Drysthelm is both interminably hot in the equatorial regions and lethally cold at the poles. Where one would expect temperate regions lie only storm wracked seas, smashing asunder all who are foolish enough to travel them by boat. With few Imperial outposts in the polar regions, the majority of the population resides at the equator - a place of volcanoes, earthquakes, scorching UV rays and very little moisture. Life is short for the itinerant peoples here. Muldacia - Tropical world whose human inhabitants live on the coastal regions, with an enormous slave population of "saurial" abhumans. Its southwestern continent was poisoned by the decaying corpse of a void kraken. Ghostlands – Region of space that commonly sees Warp effluence, vessels displaced not just by distance but in time as well. Three void kraken have been witnessed hunting in the region. At least one was corrupted by the fell touch of the Warp during Colvin’s secession. The vile abomination tore through many Imperial ships before being caught by Muldacia’s gravity well. Burgess - Little more than a frontier world for millennia, Burgess is poor in the way of mineral riches and commodities useful to the Imperium. The dusty grey soil barely supports crops and the locals usually subsist on fungal growths gathered from the caverns found throughout Burgess. Any water to be found on Burgess also comes from underground, aquifers and wells delving deep to gather fresh supplies. The only place of interest on the entire planet is a ruined city from from the golden age of technology, still locked with techno-arcane seals and identity-challenges. Gharam Lesk - Named after the infamously egotistical Rogue Trader, the world of Gharam Lesk has grown into a hive world after millennia of development and population growth. Initially classed as a civilised planet, the various warp-routes that lead towards the Centralis sub-sector brought enough trade and riches for Gharam Lesk to grow into a manufacturing giant. Many of the Chimeras and Las-weapons used in the Colvin sub-sector and it's neighbours are stamped with the stylised GL hallmark and the ancient crest of the Rogue Trader. Kriiiz - An unusual world located on the rimward border of the Colvin and Arrenthal Sub-sectors, Kriiiz is a mineral-rich death world orbitting the larger Gas Giant Junaal, much of the surface is covered in vast crystal growth as well as being heavily irradiated by it's energetic blue star. Vast electrical storms are a common occurance on Kriiiz, often sweeping across continents before dissapating over the oceans Kriiiz is home to all manner of hostile flora and fauna, including a hostile Xenos race known as the Zaazhin. Highly advanced, viciously intelligent and possessing multi-limbed, crystalline bodies that can shrug off bolter rounds with ease, the Zaazhin are extremely territorial and ferociously attack any who dare enter their home system, though almost never stray from their borders themselves. Although usually the Zaazhin's insular nature meant they could have easily been ignored by the Imperium without worry, the reports of vast mineral weath and rare elements present on Kriiiz by the Explorator Fleet that first discovered it means that future conflict with the Xenos is highly likely. Tristan Humphrey Albrecht Rockderry-Montel VII’s World – More commonly (and simply) referred to as 'Tristan's World', this large agri-world was 'discovered' by the wealthy and hugely egocentric aristocrat Tristan Humphrey Albrecht Rockderry-Montel VII, who hired a crew of intrepid explorers to go and find a planet to be named after him. Though much of the world's surface is given over to farmland, either growing vegetables or keeping livestock, the planet's primary city, Rockderry-Montel-upon-Florent, is home to a large, impressive shrine-mausoleum, dedicated to scrupulous praise of the Emperor and the occasional genteel nod towards the Rockderry-Montel family who stilltechnically own the deeds to the planet. Pallias – Low-tech agri world whose people practice a pacifistic offshoot of the Imperial Creed. The few Imperial Guard regiments raised from this world are famed sharpshooters. Charatys – Gas giant of the Beta Alumdis. Exploration of its many moons revealed a surprising discovery of life on the gas giant itself. Vast Horticultorums have been built, taking advantage of flying fields of highly nutritious, if bland of taste, planktonic clouds. Known for Imperial Guard regiments of particular daring and fearlessness. The Englican section of the Liber Cluster suffers the worst from the predations of xenos, and has a strong Inquisitorial presence. Mundus Novus – Large system housing the headquarters of the Ordo Xenos within the Subsector. Acripa – Distant world within the Mundus Novus system, where a prominent Watch-Fortress of the Ordo Xenos chamber-militant, the Deathwatch, has been emplaced. Garandor – Xenos-infested system that has regularly pushed back all attempts at purgation. It is home to a number of deadly, fast-evolving xenos breeds. Each attack against the Xenos here reveals new threats. Libertas – Home World of the Eagles of Glory Chapter, colonized by a wildly diverse array of Imperial Citizens. Anglin – Scarlet Sentinel Chapter recruitment world; Albion System. A world of islands, dominated by naval warfare. Caledon – Scarlet Sentinel Chapter recruitment world; Albion System. A world defined by it's stubborn clansmen and their taste for warfare. Cambris – Scarlet Sentinel Chapter recruitment world; Albion System. A mountainous world of both great beauty and great peril. Kalliel – Den World of the Darghoul xenos breed. Warpstorm Id’ilmar – a Warpstorm that may have been caused by a Thinking Machine, the story of which serves as a grim warning to distrust all non-Mechanicus technology. Evalissia - A feudal world on the edge of the Englica sub-sector. Evalissian Regiments are hardened by constant warfare and supplemented by all manner of mercenaries. Calahan - A thriving Agri-World ruled brutally by the Tarantus and Randahl clans. It's capital, Skyreach, is the destination for the world's great land-trains that transport the harvests. Trazis - An Ork-held world that orbits the binary stars of the Atris system, TRazis alternates between being a frozen, barren wasteland and a scorched, radioactive hellhole. Reyingras - A rocky, mineral-rich world that will likely soon be destroyed by Krantz, a rogue planetoid nearing the end of its decaying orbit around Reyingras. Upon it's destruction, the Imperium will likely begin mining the debris. Schola Scionis – World upon which the Schola Progenium maintains a presence. Known as a training world for the Tempestus Scions, such as the Veimarr Eagles. Liniam – Feudal world plagued roving bands of Orks. Left with primitive technology since the Silence, it's denizens shun Imperial advances in technology for reasons known only to themselves. Geius Prime – A Forge World that was once consumed by the Silence. Though rejuvenated by the Saneslau Mechanicus, it has an uneasy relationship with it's sister world of Liniam. Chevalius – Knight world in the Mundus Novus system, vassal to the Forge World Geius Prime. Grennarch - Home World of the Aetheric Swords Chapter. A feudal world of forests and rivers, much of the Chapter's character comes from the clansmen of Grennarch. Magadha – Agrarian world devastated by an Ork invasion. The Imperial Governor’s actions during the war prompted some to advocate for his canonization, but so far to no avail. The planet was reclassified as a mining world when purgation of the Orks rendered Magadha’s farmlands worthless. Alongside Subsectors Colvin, Englica and Liber Regnum, Subsector Arrenthal consists of Terra-facing stars, as the Cluster side facing the Imperium is colloquially known. Ensek - Though the cities of Ensek are smoggy and bleak, the landscape outside city limits is mostly rolling, mossy steppes, populated by crab-like xeno creatures. Huntordon Alpha - Though it appears peaceful, this world is dominated by gang warfare, as each struggles to produce more of the drug 'Thrash' than their competitors. Finis - A dead world quarantined by the Inquisition, it's single city is filled with black, humanoid statues, frozen in poses of horror and despair, their terrifyied eyes turned towards the black sky. Raptus - An Agri-world consisting mostly of storm-wracked seas, best known for it's global fishing industry. The population mostly either become fishermen or Imperial Guardsmen. Caeburgh – Technically the moon orbiting the dead world of Jovact, Caeburgh is home to the famous Hauer's Watch - a highly regarded military academy. Kiyaga – Kiyaga is famous for both it's rare minerals and highly corrosive fogs. The only place safe from the toxic coulds is in the high mountains, where mining operations take place. St. Crispin’s World – A once-abandoned Agri world that now serves as an outpost for Inquisitors of every Ordo. One of the furthest worlds from Holy Terra and the Imperium. Alam - Target of the xenos reavers known as Dark Eldar. Clans of Medusa Orbital Phenomena – Centennial appearance known to disrupt astropathic communications and endanger nearby ship movement. A Space Hulk made from what is clearly Iron Hands Legion spacecraft, although little else is known about it. Mertyl – Paradise world, under assault by an Ork Waagh! Coral’s Veil – Oceanic agri-world, under assault by an Ork Waagh! Artanias – Gang-run Hive-world known to skirt the edges of secession, under assault by an Ork Waagh! Tenopia Majoris – Forge world, an Imperial marvel in the art of defensive system networks. Under assault by an Ork Waagh! Ashen Abyss – Death world known equally well for its deadly creatures and highly volatile landscape. Said to be dangerous even for Space Marines to land on. Golcadi – A small, but highly fertile agri-world, Golcadi is famous for producing sweet vegetables with a thick, resilient, leathery skin. Golcadi's moon, Deltra, has two major factories on it's surface - one dedicated to carefully skinning Golcadian vegetables, and one dedicated to making products from those skins. The higher-quality ones are used to make leather buckets, gloves, or even footwear, whereas the lower-quality ones are mashed and turned into prized fertilizer for export to other Agri-worlds. Namoda Delta - A cold planet covered in tundra and pine forests. Society on Namoda Delta devolved to feudal levels during the Silence. Since its rediscovery by the Imperium little changed on Namoda Delta until the Administratum decided to build several enormous penal-cities on the uninhabited southern tundra plains. Over time the leaders of the indigenous population were trained and educated until they were sufficiently trusted to take over the running of the penal-cities. In 218.M40 Inquisitor Owan Dupont discovered a Khornate cult within the planet's leadership where prisoners scheduled for execution were released into the forests and hunted for sport. Inquisitor Dupont carried out a complete extermination of Namoda Delta's non-penal population and oversaw a repopulation of the planet from the nearest hive world. Since then the operation of the penal-cities has continued unblemished. The Soladrid Chain - Seven agri-worlds in orbit over the dead world in which Soladrid life originated. Noted for its draconic predators and talented hunter caste, the latter of which has provided many capable regiments. Soon to be on a war footing with Caeburgh. The following locations are of currently unknown position or exist outside Imperial Subsector units. The Deep – Region of space directly outside the Cluster. Though there are by definition no stars in the Deep, it does have its fair share of rogue worlds, often having been ejected from the Cluster by commonly severe gravitational stresses. It is theorized by the Adeptus Mechanicus that there may be more rogue worlds in the Deep then there are planets in the Cluster, however their very nature makes them exceptionally difficult to find. In spite of the many thousands of worlds there may be floating out there, lost in the black, only a bare handful has ever seen an Imperial presence for any mentionable amount of time. Though most that might see this statistic would balk at the opportunity to explore the Deep, there has never been a dearth of willing explorers, rogues or heretics who would make the plunge, though few if any ever return. How the hated Lions ever managed to not only survive but also flourish out there in the dark for all those thousands of years is a question many in the Liber would like to know. Grissum Primus – An Imperial world that fell to Chaos during the Silence and recaptured by Imperial forces in 102.M36. Notable as the world where Saint Raphen first revealed himself. Jussian Omega – An ork world conquered by the Imperium in 134.M36. The site of Saint Raphen's death in the Callidan Mountains is now a monastery dedicated to Imperial military tactics and history. In three subsectors of the Liber Cluster it is compulsory to complete a six-month study at the monastery before attaining the rank of Lord General. Thravis Prime - Capital city is called Lanholm. Under the thrall of the Sereiki Lions until a Black Falcons force liberated the world. Durtuvar - The world upon which Major Vincen Acuda betrayed the Imperium and sided with the Sereiki Lions. Baluarte - A heavily fortified merchant planet. Also heavily defended by Lion fleets. Has at least two moons. Capital is called Dorado. Heroda IV - Agri world formerly terrorised by the Lions. Cenicika - Agri world formerly terrorised by the Lions. Tonagish - Feudal/Knight world, burned by the Lions and its population enslaved. Home to the MkCormick Knight House. Evin Prime - Hive World and main power base for Lion forces. Capital hive is called Sitianu. Zavatista - A world covered in chem-oceans. Refinery-ships sail the seas, gathering and processing the chemical oceans into fuel for Lion forces. Barek Zayim – Former mining world turned into a forward supply base for the assault on the Eighteen Worlds. Abandoned following the destruction of the Munitorum supply complex by the Sereiki Lions. Nimobia – Lion’s held world ravaged by the Imperium, turned into a barren husk barely suitable for settlement. Andalus – Grassland-world known for its orbiting Mechanicum manufactorum-satellites and regiments. Proved a vital link in the supply lines during the Eighteen Worlds Crusade, even suffering an attack from the Sereiki Lions. Molmaga – A jungle world that was converted heavily by Imperial settlers, Molmaga is now best known for housing one of the Liber Cluster's largest prisons. In the native tongue the prison complex is called 'Matali Mact-Solk'kas' ; literally translated to "The land owned by Death". It's High Gothic it's name is equally foreboding; "The Blood Pit". The Blood Pit extends over 1,400 miles, from the Savayr Valley all the way down to the cliffs of the Gaggan Delta, and extends almost two miles into the ground all the way across it's length. The walls are solid, blood-red stone mined from the lands around the prison. The Blood Pit is home to over sixteen million of the Liber Cluster's most dangerous prisoners, and was notably used after the Eighteen Worlds Crusade to hold more than three hundred thousand prisoners taken from the ranks of the Sereiki Lions' mortal auxiliaries. Gauntfell – The world of Gauntfell is a rocky world of fogs, violent thunderstorms and very limited visibility. Daylight is largely swallowed by the near-impenetrable cloud cover that swamps the surface of the world, making it all but impossible to tell night from day. The world was claimed by the Imperium not long before the Eighteen Worlds Crusade, and was soon put to use as a prison world. Designs were made for enormous, forbidding prison complexes, designed for the efficient containment of threats to the Imperium. Notably, the first waves of prisoners were even made to mine the stone from Gauntfell's bleak surface and build the prison themselves. Casualties from exposure to the endless, biting wind, frequent deadly thunderstorms, and unending toil were commonplace, with a death toll in the millions by the time of the jail-complex's completion. According to rumours, the highest tower is reserved for imprisoned captured traitor Space Marines, and is even rumoured to hold one of Khroda's own personal bodyguards, but this is most likely a mere story put about to boost the formidable reputation for the prison planet. Talbarde – Long considered one of the key pillars of the Ecclesiarchy's might within the Liber Cluster, the Cardinal World of Talbarde is one part centre of religious worship, one part impenetrable fortress. Cathedrals of unimaginable grandeur and resplendence are built around ancient planetary defence batteries, each housing weaponry designed to shoot down potential hostile ships in orbit and decorated in the same ornate, baroque style as the churches. Despite the fact Talbarde is undoubtedly the dominion of the Ecclesiarchy, there can also be found several temples to the Omnissiah, the better to appease the Saneslau Mechanicus forces responsible for the maintenance of Talbarde's defences. Talbarde is also home to the Order of Vengeful Flame, a small force of Adeptas Sororitas who act primarily as a bastion force for nearby systems. Akina VI – The only habitable world in the Akina system, Akina VI is a popular pilgrimage destination for faithful all across the Cluster. Almost as much a Hive World as a Shrine World, housing on this world tends to be confined to single rooms, crammed in, around and even under the street-spanning temple complexes and ornate chapels that make up most of the world's major cities. Although the local Arbites and city watchmen are kept busy with near-continuous theft problems and occasional public brawls over matters of faith, and the living conditions on a planet-wide basis would, on any other world, be deemed pretty close to unacceptable, every day more pilgrims feel moved to settle on what is considered a blessed world by the Ecclesiarchy. House Barandion – The noble and ancient house of Barandion is among those few Rogue Trader Houses to predate the Imperium itself, its vaunted writ of trade penned by the Emperor Himself in the latter days of the Unification of Terra, though such knowledge is gone even from the Barandion House itself. The Rogue Trader House came to the Liber Cluster for its untapped potential, as ambitious, young heirs sought to return to the kind of glory denied to them since the hated Great Betrayer revolted against the Emperor and all of Mankind. While House Barandion has provided untold wealth of resources to the Administratum since coming to the Liber Cluster, it has refused return payments. This has raised suspicions with the Emperor’s Inquisition, who feel that the House Barandion must hold secret worlds and treasures. Ordo Hereticus/Liber Branch – The closest thing the Liber branch of the Ordo Hereticus has to an acknowledged leader is Isaac Markova al-Salvador, though few are aware that there is a joint command, alongside his wife Terys ap Diarmuid de Markova. Though externally an odd pairing, there is far more to them beneath the surface, their talents and agendas fitting together near seamlessly. The Aleph-Null Directorate – Headed by Inquisitor Lord Ermin Randahl-Tarantus, this cell focuses solely upon investigating the Saneslau Mechanicus and its vassalages, forges and holdings. Brought together after the Saneslau Fabricator-Locum was executed for heresy mid-M41, by Randahl-Tarantus himself, the Directorate continues to uncover possible agents and initiatives linked to the ill-fated Fabricator-Locum. However, outside pressure has begun to take its toll on the Directorate, as the Mechanicus has begun petitioning Cluster Command to deal with what could only be prejudice against the Saneslau Cult. From within, the ambitious and violent Inquisitor Brosdau often challenges the Inquisitor Lord’s authority. The Cydonists – While not wholly unique to the Liber Cluster, nor politically powerful within Inquisitorial circles, the Cydonists are enthralled and in many cases beholden to the Adeptus Mechanicus, displaying a surprising variety of means and methods, often mechanical in nature. To be a Cydonist is to embrace the duality of the Emperor and the Machine-God as one, to even allow that the Mechanicus Cult is correct in its view of the Emperor as the Omnissiah. While the Cydonists have strong allies in the Mechanicus, they receive nothing but hostility from the Ecclesiarchy and its allied powers. As such, the Cydonists maintain appearances when outside of Mechanicus domains, going so far as to even maintain the human shape and appearance no matter how augmented, even with the use of skin grafts and high quality vat-grown musculature. Fiend of Caerbannog – Found upon Drysthelm, in the sulphurous wastes known as Caerbannog, this monster boasts an impressive set of teeth and razor sharp talons. Accompanying a ferocious territorial mindset are powerful hind legs and lightning quick reactions, all of which ensure the Fiend an ability to pounce upon it's victims without warning or mercy. Many have been deceived by its small stature and have paid the ultimate price, their bones and trappings littering the ground around the Fiend's lair. Such is the rarity of the Fiend and its ilk, many believe that only one specimen exists. This assumption is likely due in part to the unwillingness to attempt any study of the one known Fiend and a distinct naivety on the part of those that have braved the wilderness to reach the lair in Caerbannog. The Saneslau Mechanicus – A melting pot of commerce, organized crime and the tenets of the Tech-Priests, the Forge Worlds of the Saneslau System survived the Silence where many of its less flexible sister planets were torn apart. Lacking the backing of Mars and the needed framework to gather raw materials normally, Saneslau’s salvation came from an Arch-Magos hailing from the infamous Merkova crime syndicate. These underworld aristocrats sought to gain influence in the Saneslau System by sending their young to be fostered by the Mechanicus Cult, little realizing how little ‘humanity’ these children retained upon ascension to the higher callings. This didn’t stop the knowledge of extortion, blackmail, of using wealth and guile as a shield against brute force and all the shifty wisdom that a Merkova imbibes alongside mother’s milk from being passed along and adopted by the Saneslau ruling caste. These were lessons the Saneslau Mechanicus took to rather well, and with such skills attained ascendancy over all other Mechanicus factions within the Liber Cluster, eclipsing even the impossibly distant Mars. The Saneslau Umbrii – The Umbrii are a secretive group, frequently augmented with all manner of silenced weaponry, such as mechandendrites specialized for garroting and injecting poison, and are known to graft chameleoline and other forms of optic and electronic camouflage directly to their bodies. They refer to their code of conduct as Downing’s Principles of Lethality. Who Downing was is a mystery to all but those within this secretive band. Saneslau Myrmidons – The Lord of the Saneslau myrmidons is a peerless warrior and a great leader, if hotheaded and impetuous. As such, the adaptability and machine-like precision of Cherrushky Gerjeshish, Magos Secutor and second in command of the myrmidons, is noteworthy, as often his fluid and organic battle plans are the cause behind success when his lord’s temper escapes him. Legio Phlegethon – Legio Phlegethon, cognomen ‘The Ferrymen,’ patented by the Saneslau Mechanicus, is a large Titan Legion noted for its inordinate amount of smaller Titan chassis chasses that make it up, primarily Warhounds. The Saneslau Tribunes utilize this Legion to great effect, the Princeps adept at incinerating enemies in shock assaults and nurturing firestorms that swallow all but the most inflammable terrain. It is suspected the within the elite echelon of the Legion, the nigh mythical phosphex rounds are used to devastate the enemy. Velmgharter Soldiers – The Velmgharter Soldier regiments that utilize “shackled psyker” technologies are tithed from the local PDF, highly trained urban warriors maintained and commanded by the corporate rulers of Velmghart. After the self-destructive implosion of multiple regiments, successive regiemnts founded upon this world originate from a single megacorporation’s private army at a time. This has often been to horrendous effect, as the megacorporations so selected are often targeted by their rivals in these moments of military weakness, at times even resulting in hostile takeovers. Maccaran Void Jumpers - The Maccaran Void Jumpers , former naval armsmen battalions trained by the Adeptus Arbites to aid in crowd control in the earliest settlements, this well-regarded regiment enjoys the patronage of the Saneslau Mechanicus. Over the millennia, the Void Jumpers have grown to incredible sizes, and their contingents can be seen in virtually every major battlefield across the Cluster. Due to their exceptional successes, regiments of the Void Jumpers are sometimes allowed to retire upon the heavily enshrined asteroid called Maccar. The Liniamite Volunteers - The Liniamite Volunteers are tithed from Liniam, a world still plagued by roving bands of feral orks. Though mostly composed of poorly trained conscripts, each regiment includes a company’s worth of volunteers from the Liniam PDF forces, collectively nicknamed the Ork Hunters. Though they can be quite skilled in war against the greenskin xenos, the Liniamite regiments are not the most valued regiments, and are usually assigned garrison or second-line duties when not utilized for the numerous meat-grinder missions. The Sranav Partisans – Imperial Guard regiment hailing from a Forge World formerly held by the Sereiki Lions. Suffered a period of penance for its subjugation to the mercenary lords. The regiment combines past experience in guerilla warfare with a high apportionment of armored vehicles and constructs. House Salvador – One of the pre-eminent Rogue Trader dynasties of the Cluster, having survived the long isolation of the Silence relatively intact, embracing reunification with fanatical zeal. Though often dismissed as subversive rumors, there are those who believe this House to have been, for all intents and purposes, purchased by the Saneslau Mechanicum. The Evalissian Caesars – Imperial Guard regiments raised from Evalissia that still retain strong clan-loyalties from their time in the world’s rather mercenary PDF. Order of Vengeful Flame – Order of the Adepta Sororitas based out of Talbarde, primarily used as a bastion force for nearby systems. Kabal of the Blissful Reprise – Dark Eldar responsible for a number of attacks against the Imperium within the Cluster’s boundaries, notably the world of Alam. Su’mta Craftworld – One of the great vessels commanded by the hated Eldar, though smaller in size than some of the more well-known vessels within the greater Imperium. Though perhaps a band of lesser stature, the Su’mta Eldar are vicious survivors, and their silver god of war has seen them through their hours of need. Orks – The Orks are rampant within the Liber Cluster, as they are everywhere else. When the Imperium first arrived in the Cluster all those millennia ago, it arrived within an immense Ork kingdom that took decades to break through. Though fragmented, the Orks never stopped being one of the greatest threats to Mankind’s survival within the Cluster, from the Ork hordes at the Graz-kelt systems to WAAAGH! Grimlugg Trukksmasha. The Shadow Star – Pirate ship captained by Venyadha the Reviled, a potential renegade Space Marine, witnessed fighting alongside the Sereiki Lions and other forces, leading the Imperium to assume the vessel and its crew are mercenary in nature. The Angels Exultant – Initially one of the newly formed Chapters tasked with the reclamation and safekeeping of the Liber Cluster, the Angels Exultant, led into damnation by Apostles of the Word, gave in to their titanic rages. After multiple atrocities, the Angels Exultant are now widely hunted across the Cluster. The Hammers of Olympia – Formerly of the Iron Warriors Legion, this warband suffered horrific internecine warfare following their betrayal of the Emperor in the unforgotten past. Reformed and remade under the guiding hand of its new Warlord, the Hammers, and its sorcerous contingent called the Gaiakrators, this warband has grown into a formidable threat to the Imperium. Since arriving to the Liber Cluster, they have proven to be a difficult opponent, quite capable of surviving the grinding slogs of attrition over broken terrain. The Sereiki Lions – One of, if not the greatest, foes the Imperium has ever faced within the Liber Cluster. Formerly a mercenary band, the ambition of the Lions saw them turn the tables on employers and taking control. Having amassed armies of greater size than most Imperial Crusades, the Lion’s dens have proved themselves to be veritable havens for the unaligned, the consummate soldiers. Though driven from their mercenary kingdom and into the Deep in the later years of the Reclamation, the Sereiki Lions have only grown in strength since then. The Red Offering ( a.k.a. l’Offrande Rouge) – A highly militarized and well-organized cult of the blood god originating in Gyrron that should have been, by all accounts, uprooted quite readily and easily if not for the incompetence of the Imperial Governor. The Offering has rapidly grown in size and strength, overcoming belated attempts to curb the cult and has begun expanding beyond the Gyrron System. Renegades of the Tempest – Collection of various Chaos Marines of ill repute. Included among their number are Padaricar, Vigo Shastus, ‘Crow,’ and Ba’adike the Spear-Crowned. The Blades of Transmutation – Tzeentch-aligned Black Legion warband led by Ktevaa Sero. A powerful warband that uses its high status in the Black Legion to gather around it an impressive army of Chaos Marines hailing from many different warbands. Though its actions may seem disconnected, it’s possible a greater plan is at work. The Penumbra – Secretive organization within the Liber Cluster and known conspirers against the Imperium. Led by a Lord Grey and those of the “Veiled Heart,” the exact goal of this group is unknown. The Inquisition has launched numerous investigations to learn more information; however, this unknown faction has proven itself most resistant to external surveillance, data-gathering and undercover work. The Forsworn – Vicious, unpredictable Chaos Marine warband known to utilize an internal sub-cult to handle matters the Forsworn themselves are, for whatever reason, unwilling to. The Pale Prowlers – Chaos Marine Raptor Cult that has inspired many bloody legends and folktales of predatory creatures that hunt Man himself as its prey. The Exquisite Exiles – Slaaneshi warband native to the Tempest, where they pursue unpredictable goals based on their lord’s corrupted whims. Readily followed the Black Legion warlord Ktevaa Sero upon his arrival. The Host of the Broken Dawn – Word Bearers warband that debuted in the Liber Cluster in a big way, by throwing the entire Colvin Subsector into a war that lasted centuries. Known to twist the Imperial Creed to their own ends. One of the only Chaos warbands to oppose the Warlord Ktevaa Sero. The Untaken – Renegade warband that first seen allied to the Sereiki Lions, but has since broken away. One of the more vastly sized warbands in the Cluster, with a history potentially originating among the ill-fated first settlements of the Liber Cluster. The Karnesshla – A combined Craftworld/Dark Eldar society, the only one known of its kind. Has made its presence sorely felt through devastating raids upon the Imperium. Edited by Conn Eremon, 07 March 2015 - 07:20 AM. Many considerations that often shaped decisions, particularly in the selection of gene-seed progenitors in a Founding of Space Marines, were cast aside for the 21st Founding for the sake of perfecting the gene-tech from whence it came. Though no such tampering was done with the gene-seed of the Sons of Calderon, another consideration was dismissed. Often progenitor Chapters are chosen for their stability, purity and accountability. Some Chapters, most famously the Space Wolves, are for this reason rarely, if ever, chosen. For the retaking of the Liber Cluster, there was only one Chapter that could provide the needed character. A Chapter that has, for all intents and purposes, never given up on the mythic Great Crusade. The Sons of Calderon Chapter was therefore born from the Black Templars Chapter. However, the Imperium could ill afford the Sons of Calderon learning too much of the overly independent ways of the Black Templars. The Sons instead spent an inordinate amount of time segregated with the Mechanicum during their formative years of creation. This perhaps might be seen as a mistake, for instead the Sons became attached to and influenced by a different, but equally “overly independent” Imperial faction, the Martian Priesthood. The Sons of Calderon have perhaps outgrown the typical ostracization suffered by other scions of Mars, for they have forged close ties of brotherhood with the other Chapters. Nonetheless, they retain the deepest bond with the Mechanicum of the Liber Cluster, most particularly the Saneslau Mechanicum. This relationship has been of great benefit to the Chapter, granting them some of the best equipment and most well-kept armour and ships of any other Chapter within the Liber Cluster, including rare, archaic weaponry not seen in such quantities since the Great Crusade. It is a relationship of mutual benefit, for the Sons of Calderon assist the Mechanicum in their searches for lost tech. The Martian brotherhood kept careful records of all that went into the Liber Cluster in the initial settlement waves, and they were eager to reclaim them in the second invasion. Though it was known with exacting detail what was funneled into the Liber Cluster, where those materials went once inside was far more obscure. Some of it was found when the Imperium reclaimed surviving human worlds, but much remains lost among the densely packed stars. The Sons can often be seen escorting the Reclamation Fleets, or even plunging far ahead of them, in search of lost Forge Worlds, many of which having gained legends of mythical proportions, the truths of which the Sons are privileged to know. It is notable that in spite of this relationship, the Sons of Calderon have never shown signs of holding to the Omnissian Creed, and instead appear to be devoted worshipers of the God-Emperor, something of a rarity among Chapters of the Adeptus Astartes. Their faith has given them great courage under fire, and a particular hatred for Chaos Marine Warbands. Many of the fighting companies of the Sons of Calderon are dedicated to their Oaths of Vengeance. Any such company under an Oath of Vengeance is single-mindedly dedicated to the exposure and eradication of a particular band of Traitor Marines. The Sons of Calderon pride themselves on their analytical approach to battle. Ever-quick to identify weakness in the enemy's lines or strategy, the Sons of Calderon have been the masterminds behind many victories which should have been out of the Imperium's grasp. Their use of rare technology is never more evident than when the Sons of Calderon bring their ancient, honoured weapons to bear on the fields of battle, and often the careful use of these relics is a keystone from which victory can be constructed. One other battlefield tradition, inherited from their genetic ancestors, is the rank of Emperor's Champion. One chosen marine per company is issued with a suit of the finest, toughest armour the Chapter has to offer, armed with a devastating Power Falx from the Sons' extensive armoury, and tasked with hunting down and destroying the strongest warriors the enemy side has to offer. Very few enemies can stand strong in the face of such Champions, whose blades are more than capable of cutting a foe in half with a single, powerful stroke. Captains of the Sons of Calderon are wise in the ways of their brothers - their tireless exploits alongside the Reclamation Fleets have seen them fight alongside brother Space Marines on all manner of battlefields. As such, the Sons of Calderon are adept at laying plans that play heavily to the strengths of their allies and avoid internal conflict as much as possible. During the Eighteen Worlds Crusade, a plan of campaign was launched by the Lords Inviolate and the Sons of Calderon that saw the latter Chapter torn entirely asunder as they ever-aggressively sought to eradicate the traitorous Lions. 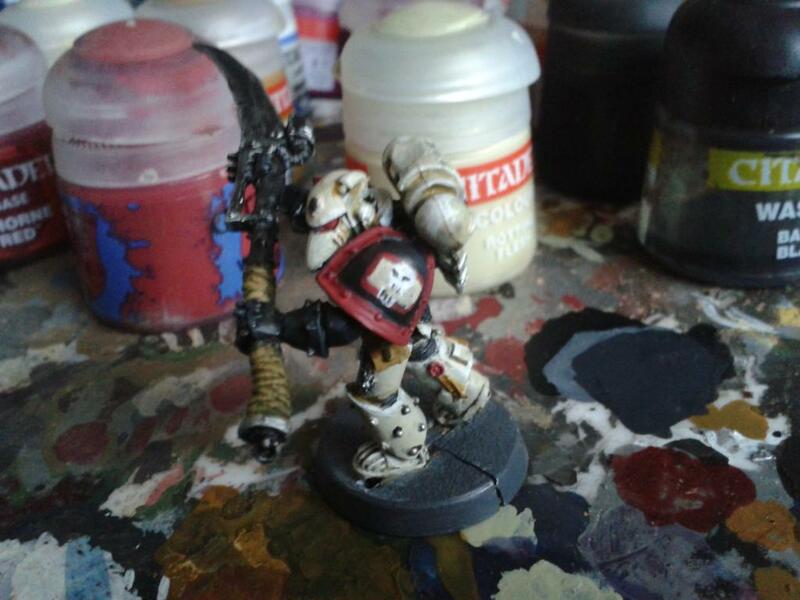 While the vast majority of the Sons of Calderon recovered from the fields of battle were either killed or left too injured to continue service, Brother Ashwin of the Fourth Company was elsewhere, having been assigned to an Inquisitorial kill-team to oversee the eradication of a heretical cult springing up on Carver's World. An energetic, fiery-tempered marine, Ashwin lent his strength and zeal to the mission, successfully purging the heretics from Carver's World in a matter of mere days. Afterwards, he was summoned to the Liber Council, and there informed of the fate of his kindred. To say Ashwin was a changed man would be an understatement. He became entirely silent and withdrawn, performing his duties with the semi-conscious numbness of someone trying not to think. When the Lords Inviolate returned to the Liber Council, they brought with them what gear they could salvage to honour the memory of the Sons of Calderon. 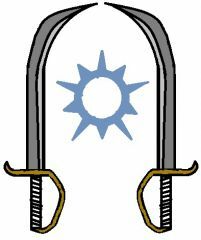 Ashwin, as the last surviving Son of Calderon in active service, requested the use of one such trophy; the weapon 'Calderon's Flame', a vicious power sword whose blade resembled the waves of the sea, or a flickering flame. Thusly armed, Ashwin continued to serve the Liber Council, frequently attaching himself to Inquisitorial kill-teams, or companies of the Lords Inviolate looking to strike at the Sereiki Lions. After the conclusion of the Eighteen Worlds Crusade, Ashwin, now old, battered and suffering from over a score of horrific wounds, has resigned himself to an advisory role at the Liber Council. He is quick to preach caution - reminding others of what fate befell the Sons of Calderon when they acted in haste. Though now almost perpetually melancholy in demeanour, Ashwin's former fire sometimes surfaces when confronted by those clamouring for vengeance. It is strongly suspected that when the burden of Ashwin's wounds becomes too great to shoulder, he will likely be interred into a dreadnought, but opinions vary on whether it will bear the heraldry of the Lords Inviolate or the Sons of Calderon, and so far none have dared to broach the matter with Ashwin. "Truly, what is politics, if not war practiced in an extremely codified and formalized manner, the elegant cut and thrust of words and influence as opposed to the thunder of bolters? Do not forget the teachings of the Primarch, my brothers. The Emperor did not create our kind to be mere blunt instruments, or even sharp ones." 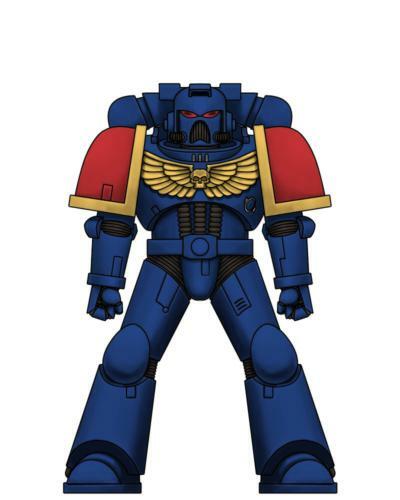 It should come as no surprise that the Chapter of the Adeptus Astartes selected to provide centralized leadership for the Liberite Chapters would be an Ultramarines Successor; however, the selection of the Lords Inviolate came from more esoteric means. The Imperial Tarot sees use across the Imperium, among Imperial citizens of all walks of life. It has decided the fates of worlds and crusades, and while there are many who would prefer to use logic and reasoning when making decisions, there are enough of those who feel the hand of the Emperor upon these cards to see its use again and again. Whichever soul had within its hands the fate of the Liberite Chapters chose to put that fate into the Emperor’s, and all cards pointed to the Lords Inviolate Chapter. It was a fortuitous choice, for the Lords Inviolate are well disposed to the handling of brother Chapters and, with the Imperial center so far away, thriving on its own. The Lords coordinate well with other Imperial forces, keeping close ties with the Liber Guard. They have thoroughly adopted the Codex Astartes as penned by their father, Roboute Guilliman. The Lords instinctively understood from the beginning that if they tried to assert their authority with a stern hand it would crumble before their eyes, and as such, they provide only quiet guidance to other Liberite Chapters. Though perhaps gentle in their position over the other Liberite Chapters, it does not mean that they doubt their authority or right to command and see it as the means to enact their will without the others harboring hostility or jealousy. With their strong tactical and logistic predilections, the Liberites have flourished under their guiding hands. The Lords Inviolate have taken for themselves a realm not unlike the distant Ultramar Realm of their progenitor. Initially taking a world classified as a death world, they have since largely pacified and colonized it, utilizing it as their Fortress-Monastery. They also claim ownership of half a dozen other worlds, of varying types. These other worlds are of extensive, valuable use to the Chapter, providing recruits, equipment, shipyards and other resources to the Lords Inviolate. These Fortress Worlds of the Lords Inviolate are deep within the densely packed center, and as such are tightly knit together, their realm being of far smaller size than the famed Ultramar. Over time, the Chapter cult has grown more attached to the Liber Cluster, cementing into the minds of the battle-brothers their Emperor-granted right and duty to maintain the Cluster for the Imperium. It is not unknown for Marines of the Lords Inviolate to keep tokens of the worlds they have traveled to, often-small stones that they keep within a pouch and carry around with them. A mosaic map of the Cluster dominates a wall deep within the Chapter Librarium, its dimensions and subject picked out by precious stones gathered from the very worlds and other locales that they are placed to represent. It is said that the Librarians have psychically attuned this mural, and it has on more than one occasion operated as an early alert system. This mindset of glorifying the Liber Cluster has provided them with a particular hatred for those found to have so thwarted humanity’s first attempts within the Cluster, the alien and the heretic. Though remnants of these beasts and traitors remain, it has not been for the lack of trying. The Lords Inviolate are studious and steadfast warriors, keen of intellect and strong of will. They adhere to the tenets of flexible warfare as laid out in the Codex Astartes; relying on tried and tested battle tactics supplemented by unexpected and tangential manoeuvres to mislead and confuse enemies. All manners of weaponry and armour see use in the Chapter, the better to respond to any threat that might see the Liber Cluster torn from the Imperium's grasp. Captains of the Lords Inviolate are almost peerless strategists, able to swiftly and decisively take command of any given situation and turn it to their eventual advantage. 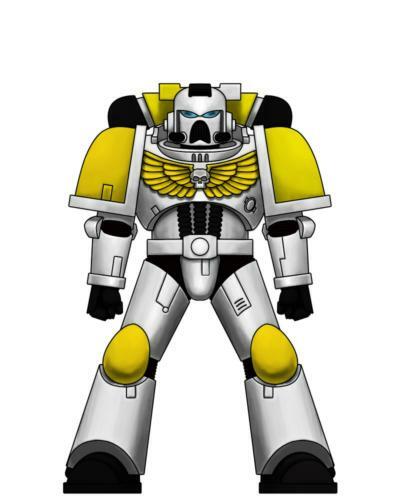 This ability has given the Lords Inviolate a reputation for remarkable capability and exceptional force management not only amongst their brother Space Marines, but amongst Imperial forces of all kinds. The Lords Inviolate recruit from an advanced world close to the heart of the Liber Cluster. Its continents are bowl-shaped. Long, unbroken mountain chains form along the coastlines, holding the great oceans and seas from spilling into the low-lying hills, valleys and savannahs that form the majority of land. The world was initially classified as a deathworld, for its native life was in its megafauna stage of development, the lands and seas dominated by immense, cumbersome creatures, with numerous apex predators, their jaws and claws strong enough to rend even the holy armour of the Imperial Guard mechanized regiments. Within scant centuries, most species of megafauna became extinct, including all apex predators. Only those great, domesticated herd beasts are safe from endangerment, and the world has long since been reclassified. Specialist of Lords lnviolate Chapter. Sergeant who handles diplomacy with mortal factions, facial features surgically altered to be closer to baseline human appearance, less unnerving to allies. A short tempered, choleric brute of a man in imposing Mark llI power armor, Luciano's extensive bionics and acerbic tongue stand in stark contrast to the rest of the Chapter's leadership. Indeed, it is baffling how such a man rose to command rank in a force that takes moderation and self control as their watchwords. lt becomes even more baffling if one has access to certain files dating back to the beginning of the Reconquest, which record a Captain Sicatris of the Lords lnviolate being ejected from war councils and negotiations dating back almost to the establishment of the Chapter, in some cases on opposite sides of the Liber Cluster simultaneously. Among those who have bothered to pry into the matter, theories range from a combination of clerical errors and the vagaries of Warp travel playing hob with the career of an Astartes veteran, to the somewhat fanciful idea that whatever his origin was, Captain Luciano has become a role played by countless Lords, to be trotted out whenever they feel an ally needs sharp criticism. Supporters of the latter theory point to the character Luciano the Fool Killer in the obscure Maccragian play Two Gentlemen At Odds, although they admit the connection is a thin one. There have been more sinister explanations bandied about, but as those bandying are usually members of the Conflagrators or Black Judges, the official response has been to quietly ignore them in favor of other lines of inquiry on what is, in truth, a minor anomaly. On the verge of censure for many centuries, the Conflagrators often disregard collateral damage when prosecuting an assault - especially when fire is involved. The use of flame weaponry is common amongst Astartes of the Conflagrators - veterans notably bearing them at every given opportunity. Flame motifs are also common in the Conflagrators, varying from small icons to alterations to the heraldry borne on a brother's battle plate. Created from Salamander gene-seed, the Conflagrators take an uncanny pleasure at watching flames, utilising them for ceremonies and warfare with aplomb. Woe betide any enemy captured by a Conflagrator for they are known to burn their prisoners at the stake. Bearing little resemblance to their primogenitors besides their love of the flame, the Chapter owes more of it's culture to it's homeworld than it's parent Chapter. The world that the Conflagrators call home is an industrialised planet with theocratic rulers. Named Cardinalis, it was settled by a colony convoy bearing devotees of the Red Redemption during the first wave of colonisers. Little wonder it is that the Chapter is itself highly religious in comparison to other Chapters. They perceive the Emperor as divine and care naught for other interpretations of Him. Of their interactions with the natives of Cardinalis, the Conflagrators select appropriate candidates for gene-seed implantation and take their leave. They often choose to have nothing more to do with these faithful, preferring to maintain solitude within their fortress monastery. Although the Chapter can be the most steadfast of allies, many relationships with other Imperial agencies - and indeed other Chapters - are bitter with acrimony and resentment. For some, it is because of the mercurial, arrogant attitude they have, for others it is the disregard they hold for orders issued by any other than an Astartes. The few they do consider friend are backed to the hilt when the need arises. They do not forget allies easily. Of all the Liberite Chapters, the Conflagrators are one of the least liked. They have rarely been considered for theatre command, if other options are available. This has gone down badly with the chapter at large and they often only attend Liberite Conclaves out of duty and nothing else. A typical Conflagrator is pious and sincere but they also tend to be bitter and intractable. This brittle nature, handled correctly, can bring a powerful vanguard force to an Imperial army. The Conflagrators make heavy use of flame weaponry in their assaults and it is seen as the only true path to purity for heretics and aliens alike – the Chapter is fascinated by flame and they do not care what burns as long as something is on fire that they can see. The marines advance behind a wall of fire when they assault an enemy, chanting their litanies as they march relentlessly through the ashes of their foes. A common assault formation of the Conflagrators is a spearhead of Land Raider Redeemers occupied by Sternguard and Tactical Terminator squads – this heavy armoured strike can smash through any obstacle and burn their way through entire cities not caring about collateral damage in the slightest. Other Imperial forces cannot fault the Chapter on their zeal on persecuting the foe but their pyromaniac tendencies rarely leave anything left for the Imperium, entire industrial continents have been burned to slag and ashes in the aftermath of a Conflagrators assault. Note: The Conflagrators still adhere to the Nikaea Edict, laid down during the Great Crusade. Thus the chapter does not recruit psykers and therefore has no Librarius. In it's absence the Chaplains of the chapter have taken on the duty of maintaining the chapter's data-vaults. In truth the Conflagrators owe little of their character to their primogenitors - the Salamanders. They do not share the more humanitarian aspects of the Salamanders' demeanour nor do they tolerate psykers beyond navigators and astropaths, and even these necessary evils are barely countenanced. Short of genetic heritage, an outside observer could be forgiven for believing the Chapter comes from different stock. It is interesting to note, however, the curious similarity of a Chapter Cult. Where the Salamanders have the Promethean Cult, the Conflagrators have the Devoted. Being a Chapter that adheres to Imperial Creed very closely, even fanatically at times, and recruiting from pious stock means that particular emphasis on faith and zeal permeate the strata of the Chapter. From the lowliest menials to the Chapter Master himself, all are required to make observances to the God-Emperor of mankind. As an extension of this, any of the Chapter - astartes or otherwise - can be inducted into the Devoted if they demonstrate particular piety. Once a member of the Cult, the adherents of the Creed take on the suffix 'Devotee' in addition to their official title or rank. 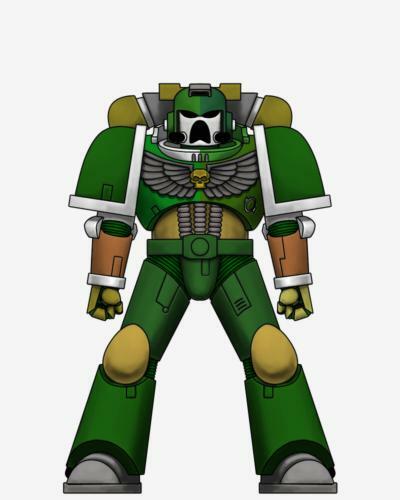 The Chapter Master must formally eschew the suffix - he is seen as the lord and master of the Chapter, and therefore the Devoted also. To ascribe him to the Cult would be superfluous. The same can be said of all of the senior command echelon - the High Reclusiarch and Chief Apothecary also must dispose of such ties. Membership in the Devoted generally takes the form of a branding, typically on the chest or the face. The symbol itself has varied over time but in modern usage the Imperial Aquila super-imposed on a ball of flame is the official marking within the Cult. Further brandings are treated as marks of honour, for those that truly test their faith and prevail. Outward appearances on the battlefield usually take the form of symbolic white flames and aquilas over traditionally orange armour, braziers and censors adorning the Devotee and, for some, lengths of chain to represent the ties that bind them to the Emperor Himself. To the lay man, a Conflagrator brother appearing mostly in white and bearing tokens of creed is expected to be looked upon with reverence and pride for he is a living embodiment of worship and war. The hallmarks of fanaticism are rife within the Devoted, as to be expected. Wounds are common with self-flagellation perhaps being the most common cause. Other known self-mutilations by the Devoted include scourging and scarification. It is often seen as a means to deny prideful urges or penitence for infractions, genuine or otherwise. The use of these practises are common and not hidden from anyone. Within the Chapter itself, being a member of the Devoted does not officially influence personal standing, nor does it confer any special privileges. Unofficially, it does exactly that. Devoted members of the Conflagrators generally tend to be more outspoken than their uninitiated brethren and more likely to associate with fellow Devoted. This in turn lends the Devoted a strong say in many matters when they convene in numbers, from strategy to diplomacy (such as it is with the Conflagrators). Even when new Captains and Chapter Masters are 'impartially' chosen by the Chaplains, there have been times when piety has trumped skill, when zeal outweighed experience. One such example is Lord Hellfyre, second Chapter Master of the Conflagrators, who was selected for exactly those reasons. He had proven able as commander of the Conflagrators but ill-suited to the politics of the Liber Cluster. A more shrewd individual could have mitigated this flaw, had one been chosen. Although the Devoted have often waxed strong within the Conflagrators, there's been occasions when they've been diminished by war or fallen out of favour in some way. These fallow periods vexed remaining Cult members, though much of the time their responses to such crises for the Devoted have been to pray, attend pilgrimages and even induct more moderate brothers in an effort to polarise their views. Sometimes this has worked, sometimes it has not. That the Cult has survived the millennia tells of the lengths the members of it have gone to in effort to keep it alive. Born without a name in an enclave far in the north of Cardinalis, the young boy learned the rules his elders lived by very early on. The strict nature of the enclave, and their fiery rhetoric, imprinted strongly on the boy. Even when he was collected from the ruins of the enclave, he held to only what knew: His faith and his discipline. As a space marine of the Conflagrators, and indeed as a chapter master, these two qualities shone through even after hypno-indoctrination. Once accepted into the chapter, he took his name - Hellfyre - from the destroyed enclave. 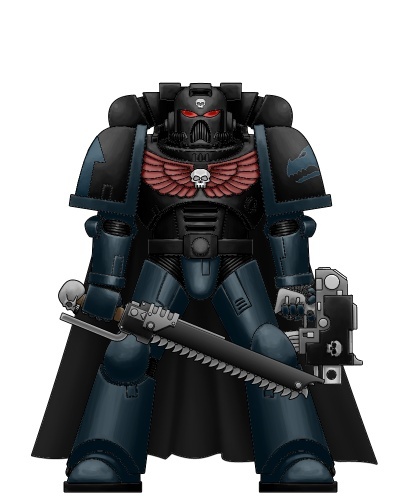 His devotion almost earned him the black armour of a chaplain but fate intervened in the Eighteen Worlds campaign, first elevating him from sergeant to captain on Zavatista, and then onwards to chapter master later. With the death of Chapter Master Sauvius, it was by the appointment of the chaplains that the second Conflagrator chapter master was selected. Hellfyre bypassed his elder captains on faith and demeanour alone, their years of service and experience counting for nought. Hellfyre lived up to his name, earning a dire reputation in the Liber Cluster for confronting and killing those he considered heathens. He was responsible for several incidents with other Liber Chapters, finding their stance towards Goge Vandire lacking compared to the Conflagrators' own convictions. "One Imperium, under the Emperor!" Often thought to be one of the most far-reaching Astartes chapters, the Eagles of Glory have become subjects of much praise by regiments of the Astra Militarum and regular imperial citizens alike. Wherever aid may be needed in the Liber Cluster, they shall be quick to provide support. They often join the regiments of the Liber Cluster in campaigns on the many worlds where xenos still reside, or come to the rescue of an imperial world being besieged by the xenos trying to remove humanity from the cluster. Descending from the Imperial Fist by virtue of the Red Templar, the Eagles of Glory perform many operations that when compared to those of other Astartes chapters could be considered humanitarian. They will willingly provide relief and supplies for imperial forces and citizens whenever possible. However, they have come under scrutiny by other Astartes chapter due to their belief that it is the Emperor’s divine will the chapter expand the reach of the Imperium and help to colonise the worlds they conquer. This ’manifest destiny’ is viewed as arrogant by other chapters who believe the Eagles of Glory seek only to increase their power and control in the Liber Cluster. The home world of the Astartes chapter is the temperate hive world of Libertas. The world boasts a great diversity of peoples and beliefs, having been colonised by imperial citizens from all corners of the Sol System. The chapter prefers to leave the majority of the planet’s political actions to the population of Libertas, while the planetary governor is the 1st company captain of the Eagles of Glory. The chapter does not do extensive recruiting, as there are many volunteers to the process. It is considered the greatest honour for a family to have a son become one of the Emperor’s greatest warriors. Even though the other chapters of the Liber Cluster are distrustful of the expansionist ideals of the Eagles of Glory, they will accept their aid without second thought. The chapter always strikes fast and hard, often bringing an entire battle company to the conflict to ensure that the Emperor’s justice is rightfully enacted. The Eagles of Glory are also one of the most common attendants of the Liberite Conclave, often putting in their word on whatever discussion is occurring at the time. "Damn the lances! RAMMING SPEED!!!" -4th Company Captain Davian Farrigun, Master of the Fleet. Brash, headstrong and always searching for the next chance to prove themselves, the Eagles of Glory could easily be mistaken for sons of the Great Khan rather than their true Primogenitor, the Emperor's Praetorian Rogal Dorn. Again the same assumption could be easily forgiven were one to look at their preferred style of warfare, as the Eagles live by the philosophy “the best defence is a strong offence" and believe that the quicker they can crush one enemy and move on to the next, the better. It is with this strike first, strike hard mentality in mind that the Eagles have shaped their battle doctrine, believing that the ideal fight is one in which your first blow is also your last, hitting the foe without warning and with such overwhelming force that nothing can resist you. As a result, the Eagles are constantly on patrol, combing the far reaches of the Cluster for enemies. Upon the discovery of a threat the Astartes make all haste to the warzone, heedless of whether their help is needed or wanted, and engage the enemy immediately. In naval actions, their ships are infamous for aggressively engaging hostile fleet elements as well as performing daring manuvers that, although undeniably effective, border on the reckless. At the same time, the Eagles will deploy en mass to the embattled planet's surface via drop pods and Thunderhawk Gunships, often right on top of, the enemy positions. While this approach is highly dangerous it also grants the Eagles an advantage in that their opponents will have almost no time to prepare for the onslaught that is about to assail them. As the fiery forms of Drop Pods hammer down to disgorge dozens of Tactical and Assault marine into the embattled foe, Thunderhawk landers will deploy spearheads of Predator Tanks and Bike Squads nearby to support the first wave as Land Speeder and Stormtalon Gunship squadrons scream through the skies overhead to lay the target to waste. Once all opposition has been neutralised and any objectives secured the Eagles will return to their ships and set off once more, leaving the corpse-choked battlefield as quickly as they came. The world of Libertas gathered settlers from many worlds of the Liber Cluster. At first, cultural differences between settlers and outrages committed against native Libertines created a hostile environment, of wars that raged across the world. Many independent city-state Hives took root over time. Though leagues were formed, they were by and large antagonistic of each other. The Eagles changed that. Service to the Emperor demanded unity of purpose and mind. Though the Libertines had no desire for such unity, a union was nonetheless enforced. As centuries became millennia, the city-state Hives have become increasingly dependent upon each other, unified under umbrella rule of the Eagles of Glory. The world is not without conflict, as old rivalries arise. Once, when the entire Chapter was assembled elsewhere on crusade, Libertas degenerated into a civil war that spread across the globe, quickly put down by the Eagles' return. With internal conflict being so generally low, the Eagles instead rely upon the extensive martial traditions across Libertas, not unlike the military academies of distant Macragge, for recruits and serfs. The Eagles of Glory chapter boast a great many traditions do to the multicultural nature of their recruiting pool. Their recruits come from all corners of Libertas and bring with them many traditions that had been passed down through their heritage since the recolonisation of the world. One such tradition is the Ha'ei, it was first brought into the chapter from recruits from Libertas' equatorial island chain. The Ha'ei consist of the brothers of a squad, or sometimes many more than that, gathering around their sergeant who leads them in pre-battle chants. The sergeant begins with about four to six lines of prose, invoking the warrior spirit instilled into them. After this he lets forth a loud yell accompanied by a tribal dance in which the squad members squat and hold their arms parallel at chest level. The sergeant lets forth another yell in which the squad begins chanting in unison whilst slapping their thighs, chest, and forearms. It is at this point the warrior spirit fills each brother, his bloodlust and desire for battle heightening with each slap of his body. The display is about five minutes long and is practiced primarily by the sixth company of the Eagles of Glory, though it is not uncommon for a few squads within each company to practice the Ha'ei before battle. Perhaps more than any other Chapter, the Kindred have been shaped and molded by the Liber Cluster. Although Imperial records mentioned three fleet based Astartes Chapters (the Hell Tigers, Chevaliers, and the Knives of Guilliman) were attached to the initial settlement expedition, it was still a shock when the second wave of Imperium forces who entered the Maloccio system received orders to declare their identity or be destroyed on standard Astartes frequencies. It was the first, but far from the last time this unorthodox Astartes contingent would baffle their newly arrived brethren. Although initially hailing the new arrivals as a respite from their centuries long guerilla war against "greenpig" and "blacksoul" forces, it was not long before the relationship soured, due to matters ranging from the Kin's divergent battle doctrine (which makes heavy use of mortal specialists and salvaged Imperial Guard vehicles) to the archaic honor codes, superstition, and local folklore that has melded with their Chapter Cult (cults?). The Kin see themselves as war-shamans, mediaries between the Emperor and His Primarchs and the people of the Cluster. The "Ten Heavenly Lords" are revered as mercurial and capricious deities, who must be placated by votive offerings and ritual before they will bless their creations. Furthermore, the Primarchs as venerated by the Kin have little in common with the figures from Imperial history. For example, Roboute Guilliman is worshipped as the War King, a peerless fighter in scarlet and bronze armor who forged a great empire with the edge of his sword, while Leman Russ is admired as a wandering philosopher mystic, patron of the arts, healing, and those who practice "white sorcery." While the Kin's divergences have led for some to call them to be declared Excommunicate Traitoris and wiped out, the Chapter's current leader, Grandfather Baptiste, has formed a strong working relationship with the Inquisitorial elements present, who make good use of the Kin's local knowledge. Likewise, the Kin show an unusual deference to the Conflagrators, and often follow that bitter Chapter's lead in both council sessions and on the battlefield. 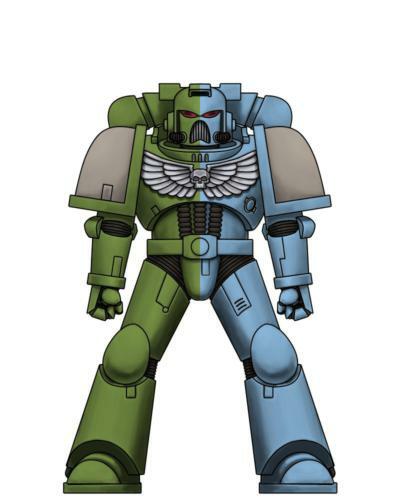 It is theorized that this is because in their pantheon, Vulkan is a grim figure who rules over the part of the afterlife where the unworthy dead atone for their sins with centuries of fiery torment and drudge labor before being allowed into the Emperor's paradise, and they see the Conflagrators as living messengers from the tyrannical Hammerer. The Cults of the Nine permeate the Blackjaw Kindred through and through. More than just a belief system, it influences their behavior, their outlook, and their wars. Though the Kin worship the Nine undivided, as a pantheon of near equals, the Chapter’s unique structure is riddled with unit types that are in clear reliance to one of their God-Progenitors over the others. Russ, the arcane yet wisest of the Nine, stands foremost in their eyes, however among the Circles of Kin each of the Nine sees expression. Bearing the heraldic cross upon the shield of Dorn, Kindred Dreadnoughts, the heroic fallen, have an intimate, but exclusive connection with their chosen favored progenitor. These legendary warriors, their biological bodies broken and shackled to mighty war-engines, have felt the stony hand of Dorn upon their very souls, guiding them back from the Shadowlands to fight alongside their brothers once more. The Circles are not what would be considered Codex adherent. There are no reserve Circles, all are battle-ready and proportioned according to their Patriarch’s wishes, and often by the Patriarch’s chosen cult. Such is the case with the 7th Circle, led by Patriarch Tréhoart, a former Breacher sergeant that openly bears the jagged gold symbols of the Khan, the merciless mistress of the currents of fate, even after his ascension to Patriarch, when the other Patriarchs assumed he would forsake the Judge in the Deep for the White Mystic, the favored Russ. Under his guidance, the 7th Circle is particularly suited to void warfare and boarding actions. Though the 7th Circle is not alone in its ceaseless pursuit of war, far from home, not all Circles venture far from the hearth. By tradition, the 2nd Circle’s Patriarch is selected among the Kin who identify most strongly with the Lion. The 2nd Circle rarely travels far from the Kindred’s chosen worlds, tasked by its own predilections to patrol and safeguard them. It is the 2nd Circle that locates and selects potential Chapter inductees, as well as quelling unrest and defending them from outside attack. However, should an enemy strike and disappear before the 2nd Circle could arrive in defense, then their Patriarch will order the pursuit and systematic destruction of the foe, and terrible is their vengeance to behold. As with almost every other aspect of the Kin's existence, the method in which they fight their wars has been influenced heavily by their long isolation within the Liber Cluster, and their veneration of the Primarchs as the Nine Heavenly Lords. As each of their fifteen Circles (roughly equivalent to a Codex Company) varies in size and disposition according to the whims of its Patriarch, it is more helpful to discuss their organization in terms of the specialist formations organized around the cults of the Nine. The average Kin battle brother carries a bolt pistol and a "machanoir", a chainsword variation which has more in common with a polearm. The "teeth" make up a far smaller portion of the overall weapon than the standard chainsword, and the durable hafts are used to parry blows, trap weapons or limbs, and club at an opponent in order to set up a kill strike with the toothed section. It is believed that this weapon was created to deal with the Kin lacking the facilities to manufacture chainweapon blades in the quantities necessary to fully equip a standard Chapter. Likewise, the semi-automatic bolt pistol expends rounds much slower than a bolter. The Kindred's tactical squad equivalents typically fight in loose, catch as catch can formations, with an emphasis on darting forward, landing a quick strike with a machanoir (or a point blank shot from a pistol pressed directly against the target) and then quickly retreating back to the safety of one's own lines. These forces are usually bolstered by Cuirassiers, champions who honor the Battle King above all others. Noted marksmen, these warriors are allowed to wield modified bolters, combi weapons, and power blades as they compete with one another to perform great deeds in Guilliman's name. They may be easily recognized by their ornate red and bronze helms and armor, which each warrior farther decorates with his own unique heraldry so that their fellows (and the watching Primarch) will easily recognize which hero is achieving great feats of arms. During the Silence, the newly formed Saneslau Mechanicus severed all ties with nearly every other Imperial faction in the Cluster, including the devastated Chapters that would later become the Blackjaw Kindred. As a result, the Kin have evolved into an almost entirely infantry force which relies on drop pods or jet packs for battlefield mobility, and such Land Raiders, Vindicators, and so forth as they have serce more as rolling shrines to the Nine than actual weapons of war. This deficiency is partially offset by the large amounts of Tactical Dreadnaught Armor the Kin posses, with each Circle possessing its own cadres of Terminator specialists. The Stormbringers, an all Terminator cult spread across several Circles, seem to have had their genesis in an attempt to compensate for a lack of armored vehicles by modifying Terminator armor to serve in an artillery support role. Devotees of Ferrus Manus, these hulking masters of ordinance support their brethren's hit and run tactics with devastating barrages of missiles. Wargear: Grandfather Wolf's Blessed Beard. All devout followers of Grandather Wolf aspire to grow and show off a mighty beard. Grandfather Baptiste has always sported a beard all the way from inception into the chapter as an aspirant. As he advanced through the ranks and gained his exalted station he grew his beard according to chapter doctrines and the beliefs of the followers of Grandfather Wolf, so much so that now he sports a mighty beard, so mighty that he could bludgeon a fully grown Grox to death! The Blessed Beard has never known the purposeful touch of a razor although it has suffered in melee more than a few times, it has always grown back. It has even grown back in the space of a night such is the power of the Blessed Beard! His beard can at times become unruly and it has to be wrenched, beaten and threatened verbally with the threat of pulling out! Grandfather Baptiste maintains his force of will over his Blessed Beard and it serves him well as a fine example of virility and power, so much so that even as his hair grows to silver his Blessed Beard can still be shown to be black as pitch. Of all the specialized cult formations within the Blackjaw Kindred's pagan hierarchy, the one devoted to the Angel Sanguinus is perhaps the most controversial. 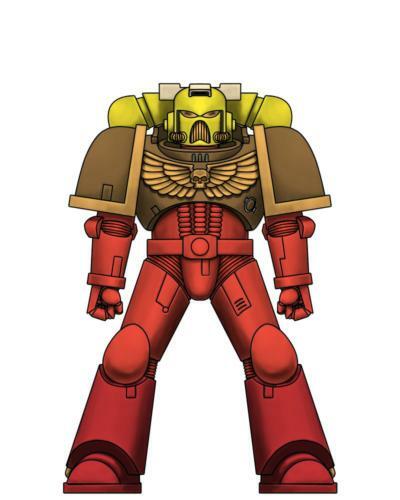 As with all the Emperor's sons, the Kin's depiction of this Primarch differs radically (some would say, heretically) from that of the larger lmperium. Sanguinus is conceived as ruling over art, creativity, and insanity, and is often depicted as a stocky figure with a flaming red beard, one of his eyes missing, and wings of precious stones and metals, not feathery pinions, sprouting from his shoulders. Those Kin who venerate him above all others serve as the Chapter's Techmarine equivalents, but they eschew indoctrination in the Machine Cult and extensive bionics in favor of a regimen of memory and cognition enhancing drugs and rituals performed by the Medicine Dogs (Librarius equivalent) which render the aspirants high functioning technosavants, and induce an almost uncontrollable urge to tinker, modify, and create that has been unfavorably compared to that of the jokaero and greenskin xenosbreeds, although rarely in the hearing of other members of the Kin, who tend to be violently protective of their "inspired" brothers. Those newly inducted into the Angel's sect are generally grouped together when their Circle goes into battle, fighting as a mass in the ornate, heavily modified suits of power armor each brother customizes and personalizes according to his own taste and flashes of "genius", a practice cynical observers have noted confines all potential collateral damage to a single unit should said modifications end up backfiring dramatically on their makers. Those who survive this stage and stabilize their altered psyches will be honored with promotion to the Morghaeth, the true master craftsmen of the Kin, who forsake the joys of battle so that they may devote all their time to repairing and maintaining the Chapter's most sacred and complex machine-relics. On multiple occassions, accusations of tech-heresy have been lodged against the Blackjaws for perpetuating this (to say the least) non Codex compliant system, but each time the process has broken down into legalistic wrangling between the Martian Orthodoxy and the Saneslau Mechanicus, over who has the authority to chastise the wayward Astartes, disputes some claim are instigated by the Kin themselves. Although for the latter to be true, the Grandfather and his Patriarchs would need to have a taste for and talent at intrigue far outside the norm for Astartes. The Iron Ravagers are descended from the lineage of Ferrus Manus. They have established their home world on the planet of Anesidora, a planet dominated by virulently fertile jungle. The Iron Ravagers share their forefather’s contempt for the weakness of flesh, and embrace the sacrifice of much of what makes them human in pursuit of a perfect blend of human and machine. If Anesidora was settled by humans during the initial settlement of the Liber Cluster, the jungle has long since erased all evidence of their fate. The Iron Ravagers were attracted to the planet by the unique metallic and crystalline structure of the planet – which both supports the abundance of ‘hyper-life’ on the planet, but more pertinently offers a wide variety of valuable resources, including much that the chapter itself covets, notably extraordinary veins of the psychically resonant psycurium. The Ravagers are warriors, not miners however, and offered to share custody of the world with the agents of the Adeptus Mechanicus in a deal that is perhaps unique in the Imperium. The chapter safeguards the world, receives privileged access to the resources it produces, and recruits from its Martian derived population. The ability of the chapter to consistently identify sufficient numbers of suitable candidates from the relatively small population, many of whom are too altered to breed, would in other circumstances perhaps attract more curiosity. In the frontier that is the Liber Cluster, it is just one anomaly amongst many. As it is, rumours circulate of arcane biological processes and clones, hot-housed in the super-fertile environment of Anesidora. Given the constant struggle of the machines of the Mechanicus to overcome the virulent life of the planet in order to extract its mineral wealth, the Ravagers' inherited distaste of the biologic has only been reinforced. As a symbol of their rejection of the physical identity of their birth, in favour of the engineered perfection that is fusion of humanity and machine, they undergo an elective augmetic alteration soon after their initial induction into the chapter. Unlike the artificial fists of the Iron Hands, it is their face that is replaced, with a smooth, featureless adamantium face-plate being grafted onto their skull. While it leaves their superior Astartes sensory faculties intact, these identical face-plates give the Ravagers a disturbingly identical appearance. The Ravagers are broadly codex-adherent in terms of their organisation and battle-field approach. The chapter perhaps unsurprisingly boasts a high number of techmarines and makes extensive use of dreadnought armour. Their approach to battle reflects the duality of their Primarch’s approach to war – a coldly logical and exactly preparation and execution of their duty, combined with a terrible wrath that overflows when confronted with the enemy. The Ravagers have developed their approach to war to successfully include the wrathful zeal that seizes them in the heat of battle as a factor to be counted upon, and used to their advantage. Their chapter badge with the fourth and fifth digits depicted as augmetic replacements - symbolic of the weaker aspects of their flesh (the weaker ring and pinky fingers) being replaced by elements of the machine. (Excuse the very basic MS Paint version used here - I think it conveys the idea at least). The abhorrence of weakness means the recruitment process of the Iron Ravagers is particularly brutal, even by Astartes standards. Only the strongest, toughest, most cunning, may join the ranks, so by extension there can be only one Aspirant left at the end of the trials. On the worlds from which they source their Aspirants, arenas have been constructed, designed to push potential candidates to their very limits. Intense heat, blistering cold, extreme winds, separating floors, and death traps all feature, with the faceless Ravagers standing sentinel over the proceedings. The last Aspirant standing (if such a thing can be said) is then taken immediately to begin the implantation process. No respite is given, not an ounce of weakness can ever be shown. At any point if the potential Astartes ever begs for mercy, he is put down. Some have even gone mad at the sight of themselves, a reflection of a cold, faceless monster, and again these poor souls are ended for their weakness. Those that survive all of this are inducted to the ranks of the Iron Ravagers, with no trace of weakness anywhere to be found within them. The Blades of the Lion are a crusading, fleet based Chapter currently located in the Liber Cluster. 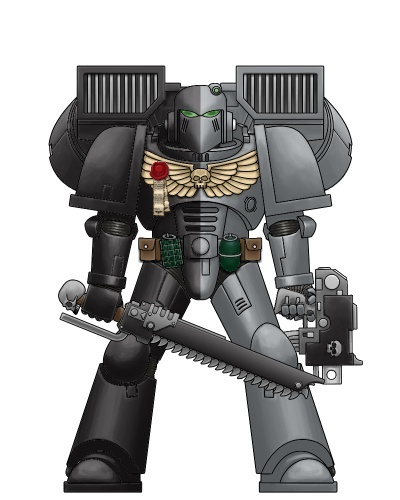 The Blades are Dark Angels successors from an ancient founding who prefer to fight alone which has almost doomed them several times since they were created; they are prideful and will never ask for assistance even if they know they are doomed. Without a homeworld, the Blades roam the Cluster in their Strike Cruisers either attacking pirate and xenos strongholds wherever they find them, dropping from the skies in drop pods or tearing through enemy ships in brutal boarding actions. Their leaders are master tacticians and take pride in surrounding the enemy and seeing utterly annihilated. The Chapter has a history of battling Orks in the Liber Cluster, matching the prowess of their bike-mounted warriors against the Ork mechanized hordes but it is against Traitor Space Marines that the Blades fight the fiercest. The Blades are able to fully test their mettle when fighting foes comparable to themselves and relish it believing themselves to be utterly superior to anything that isn’t a Space Marine. To outsiders the Blades of the Lion appear to strike at random then disappear into the void afterwards but in reality they are being guided by their Librarians who believe they are receiving visions from their Primarch in pursuit of the “Great Hunt”. Their Chaplains work alongside the Librarians deciphering the visions and interrogating prisoners to find their next target. It is unfortunate if any of these visions strike during a battle as the Blades may suddenly redeploy before their quarry escapes – this makes the Blades a sometimes-unreliable asset in a large campaign but if they have the numbers, they will endeavor to leave some marines behind so their allies are not overwhelmed. The Blades will recruit from wherever they can, the Cluster is large enough for them to have plenty of recruiting worlds to choose from but they do not lay claim to any specifically. Once an initiate is taken in they are mind wiped and they will only know the Chapter. The “Great Hunt” is known by all of the Blades but only the high ranking marines know exactly what the Hunt is actually trying to achieve, the commanders know that the targets they hunt are the forever cursed Fallen. The rest of the Blades believe they are hunting traitors to the Emperor and are not aware that their targets were once or are still Dark Angel Legionnaires. The Blades of the Lion are not trusted by most of the Liberite Chapters due to their isolationist attitude and tendencies to withdraw from combat without a word. The Blades rarely attend a Liberite Conclave but when they do their words are seldom ignored when planning assaults yet they will never offer themselves to be the lynchpin of a campaign, the risk of duty to the Imperium and the secret shame of the Great Hunt could spell disaster. Edited by Conn Eremon, 31 January 2015 - 08:32 AM. Battle-Brother Raleigh of 3rd Squad, 2nd Company. Descended from the Gene-line of the VII Primarch, the illustrious Rogal Dorn, the Scarlet Sentinels have inheirited their Primogenitor's legacy of loyalty, honour, and pig-headed stubborness. Distantly ruling the Albion system from their spacebound Fortress-Monastery known as the White Hall, the Sentinels poach the most promising recruits from the system's three inhabitited worlds of Anglin, Caledon and Cambris. All three are feudal worlds, having recently discovered gunpowder and the many feuding kingdoms on each planet provide the Chapter with a bountiful supply of potential recruits as well as a strong base from which to operate from. Amongst the Astartes of the Liber Cluster the Scarlet Sentinels are renowned for the strength and skill of their Chapter Fleet, as well as it's larger-than-average number of vessels, thanks to deals with the Adeptus Mechanicus regarding mining rights to the Albion system's asteroid belts and uninhabitited moons. As a result the Scarlet Sentinels can often be found escorting or even leading expeditionary fleets into unexplored or hostile regions across the length and breadth of the Liber Cluster and they are often the first Chapter called upon whenever unusally troublesome or difficult xenos raiders make themselves known. Generally the Scarlet Sentinels are well-liked among the Chapters and Organizations of the Liber Cluster, their honourable conduct in battle, disciplined nature and exemplary service in the Emperor's name having earned them great recognition. One of their most notable allies is the Lords Inviolate, who the Scarlet Sentinels have worked alongside many times, building strong bonds of brotherhood between the two Chapters throughout the years. However, relationships with certain other Astartes , such as the excessively destructive Conflagrators, are less then steadfast, the worst without doubt being the tense relations with the Eagles of Glory. Despite both being children of Rogal Dorn these two sister Chapters could not stand further apart, a bitter eninimity existing since the earliest days of the Imperium's second expansion into the Cluster when the two groups were paired together as a joint strike fleet that personally retook several systems from a minor Ork empire. As the Sentinel-lead fleet annihilated their Greenskin counterparts in orbit around a planet the Eagles would perform mass orbital drops onto the enemy strongholds, hammering down upon them like the Emperor's own fist and liberating those human populations that had lived as slaves to the Orks for centuries. It was this that gained the Eagles such immense adoration from the liberated worlds while the Sentinels, whose's part in the fight had been mostly confined to orbital superiority, were largely forgotten. The bitterness that resulted finally came to a head when the planet of Libertas was awarded to the Eagles by the Liber Conclave as their homeworld in recognition of their efforts, the then-Lord Marshall of the Sentinels, fuming at the news, was said to have angrily departed the Conclave without a word, taking his Chapter with him. 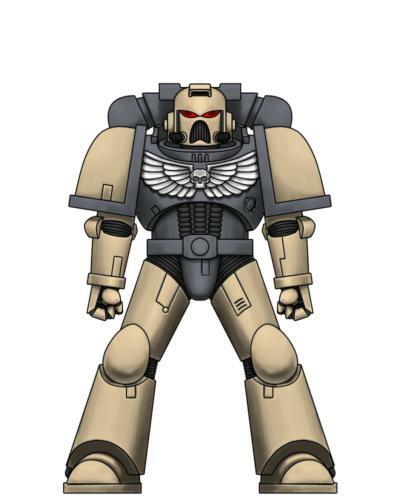 In terms of Chapter organization the Sentinels are Codex-compliant, fielding the usual ten companies with only minor deviations regarding titles, such as the Chapter Master being referred to as the Lord Marshall. In groundside combat the Sentinels favour infantry tactics, backed by mobile outriders and heavy artillery to pummel their foes into submission whilst scout units infiltrate behind enemy lines to perform reconnaissance, sabotage, and when possible, assassination of enemy leaders. The Scarlet Sentinels had changed the tide of many of their battles through their naval superiority. Nearly all campaigns are focused around eliminating the enemy navy first and foremost, proceeded by creating a blockade around the planet. This ensures nobody leaves or comes without first meeting the big guns of the Sentinels' navy. Once a blockade has been established orbital bombardments are often conducted to hit key enemy fortifactions, creating opportunities for ground forces to come in and make short work of the remaining enemy forces. The Scarlet Sentinels are also reknowned for their discipline with holy bolter and prefer to engage enemies from a distance rather than engage in barbaric close combat. As such, it is uncommon for the Sentinels to deploy assault squads armed with melee weapons. In the early days of the second Liberite Invasion, there were few worlds that still belonged to the Imperium. Many worlds had been reconquered by the xenos species that had originated there, or had been overrun by a new threat. One such world was Libertas. The world was key to claiming the Mundus Novus system, and had been invaded by the varied forces of their heretic brothers. The system had been home to many imperial worlds of great importance, among these worlds were Chevalius, a world known to possess a great deal of Knight armour. Also among these worlds was the forge-world Geius Primus, the world produced much of the weaponry used by Imperial forces. The system was set to be one of the first major acquisitions of the Imperium in the second invasion. As such, two chapters of the Adeptus Astartes had been assigned to claim it. The first, the mighty Scarlet Sentinels. Masters of naval warfare and cold discipline, few enemies could match their prowess in orbital warfare and even fewer could challenge their resolve. And the second, the relentless Eagles of Glory, unrivaled in manpower and sheer firepower on the ground. This was seen to be the perfect combination for invading and claiming worlds in the name of the Imperium, one chapter to decimate enemy fleets in orbit above worlds, and the other to annihilate the ground forces of the enemy. The combination had proved to be quite successful, for many of the missions the pair had been assigned to we're handled with the utmost efficiency. The conflict started with the Scarlet Sentinels emerging from a warp jump and bombarding enemy forces with all manners of naval weaponry, and skillfully executing many maneouvers to avoid enemy fire and trap them. the Sentinels had emerged from the combat with minimal losses. This had paved the way for the Eagles of Glory to initiate planetfall. The Eagles had deployed en masse, fielding almost half of the chapter to combat the greenskin forces. They had decimated enemy fortifications with the sheer amount of firepower from their many predator tanks and drop pod assaults. The Eagles did not fair quite as well as the Sentinels, losing multiple tanks and six squads of battle brothers, but nonetheless conquered the planet for the Imperium. The sole surviving hive of the conflict, Columbus, had venerated the Eagles, showering them with all manners of praise and worship. Unknowingly to them, the ground war had been the part of the battle that was of lesser importance. The main part of the battle was fought in orbit above Libertas. After defeating the ork fleet that was stationed above Libertas, the Scarlet Sentinals wisely set about creating a blockade. Mere moments after the Eagles made planetfall a massive fleet of traitous guardsmen led by a vanguard of chaos marine Hades and Hellfire class cruisers had emereged from the warp near Libertas. The fate of the planet was firmly thrusted into the hands of the Sentinels at that point. The Sentinels valiantly fended off the host of chaos forces intent on defeating the imperial invaders. They deployed all of their thunderhawks to engage in all out orbital warfare and and caestus rams for boarding actions. During the fighting, the strike cruiser "The Conqueror" had been severley damaged. The Conqueror's captain, Thomas Beckham, ordered all crew members and passenger to evacuate the ship. In a final act of faithful service to the Emperor, Beckham rammed The Conqueror into the starboard of the attacking fleets sole capital ship. He then proceed to overload the plasma core of his ship, causing a massive exlosion that engulfed many of the heretic vessels alongside the capital ship. Without clear direction, the chaos forces had lost all coordination and were easily crushed beneath the heel of the Sentinel's fleet. Astonishingly, very few losses were incurred by the Sentinels -excluding the loss of The Conqueror-losing only a few escorts. Their superiority in the void and the discipline they possessed in all aspects of war had seized victory for the Imperium. At the following conclave, word from Libertas of the exploits of the Eagles had greatly influenced the decision made by the council present there. Libertas was to be presented to the Eagles for their valiant actions. Enraged by the complete ignorance of the people of Libertas to the Sentinels valiant defense, the Lord Marshall of the Scarlet Sentinels promptly took his escorts and marched out of the conclave, from that point on becoming bitter of the Eagles of Glory. Speed, mobility, and rapid reaction are the cornerstones of warfare as practiced by the Aetheric Swords Battle Companies. With the strains of the Undying Choir echoing around them, these zealous warriors sweep down upon the enemies of the Emperor, using Bikes, Land Speeders, and Assault Marines to scythe through the enemy lines, with battle honors being granted to anyone who manages to strike down a heretic or xenos warrior in the act of drawing his weapon. Tactical squads are specially trained to embark and disembark from their Rhino transports at speed so they may support these wild charges with fusillades of bolter fire and elegant flurries of chainsword strikes, before withdrawing to their vehicle ans allowing it to bear them to the next target. In these lightning onslaughts, the Undying Chorus itself becomes a weapon, the rising crescendos overawing enemies even as the Swords mow them down. It is a rare foe who can survive these murderously quick onslaughts, and an outside observer could be forgiven for assuming these shining lancers constitute the epitome of the Chapter's warriors. "Last blood counts for more." But should an enemy prove especially resilent, the Chapter's heavy weapons and artillery specialists are unleashed, with Terminators, Land Raider and Vindicator heavy tanks, and Dreadnaughts lumbering forward to crush anything that stands before them with implacable fury. These warriors, most of them giants even by Astartes standards, are also the Sword's experts in siege warfare, and Chapter lore claims that enemy hordes have faltered and broken before their bastions at the mere sound of their thunderous voices echoing the Chorus's refrain from the walls. The three Battle Companies, the Eighth Assault echelon, and the Sixth Reserve all traditionally favor the first school of tactics, while the Ninth Devastators, Seventh Reserve, and the "Cauldron Born" elite of the First are adherents to the second. Rivalries between the two contingents are common, with some claiming that the Chapter's Librarians encourage the emnity, either to motivate the warriors in striving to outdo one another...or to ensure they're too busy bickering with one another to question the dominance of their gifted brethren. "The guilty were always once innocent"
Among the Imperial forces operating in the Liber Sector, the Black Judges are ones of the Chapters that earned a dire reputation for their cold effectiveness and their ruthless treatment of the Imperium’s enemies and citizens alike. Indeed, their unusual behavior, even for members of the Adeptus Astartes, has led some to speculate that their assignment to the Liber Sector has been taken as a precautionary measure to keep them away from the Imperium at large. Highly secretive and distant from other Chapters, they dutifully enforce the supremacy of the Imperium through brutal shock attacks in the cover of the night that leave their targets always almost entirely devastated save for a few survivors. It is not out of mercy that the Black Judges keep these poor souls alike, but so they can spread the story of the assaults. While zealous prosecution of the Imperium’s threats is usually highly praised, the Black Judges direct their wrath indiscriminately towards xenos, heretics and citizens at the least amount of suspicion of treachery or heretical behavior. Squads or even lone Black Judges regularly conduct secret investigations on suspected threats, creeping and watching at night over their prey, in search for the least sign of deviance. When they finally find it, or if proof is lacking but suspicion is high, they pounce unseen from the shadows and unleash punishing volleys of boltgun fire or rip their targets apart with the chainswords. They will often knock their weapons together before and during a fight in complete darkness or babble strange sounds, and it is rumored that their gene-seed has mutated to provide them some minor echolocation capability. When purging xenos, they will often spend long periods, sometimes months, observing their targets from the darkness, until the moment at which they can cause the maximum physical and psychological devastation arise. At that moment, they will unleash the full might of their so-called “Prosecution Campaigns” and will obliterate the foe’s morale and ability to sustain the fight. This effective tactic has been caused for concern amongst the other Liberites Chapters, mainly because more and more reports have come from both fringe and central worlds of lone survivors from utterly devastated settlements telling the story of black clad armored giants seemingly appearing out of nowhere and laying waste to everything and everyone they saw. While the Black Judges seek to maintain order at all costs through fear, this perception is not shared by other members of the Imperial Adepti present in the Liber Sector. Their livery is of a dark royal blue on their limbs underlying the gleaming pitch-black armour of their upper body. Each Black Judge wears a large night-black cape in order to better conceal their features when investigating or before an assault, and when the red of their eye lenses and Aquila is finally revealed, it is often the last thing a person will see. They are a fleet based chapter, always roaming in the darkest interplanetary voids of the Liber Sector. Although it is still unconfirmed as of yet, they appear to be recruiting by abducting prospective candidate and letting them fight amongst others, the Trial by Trial, to decide the ones righteous enough to join their rank as evidenced by the highest disappearances rates throughout the Sector recorded after particularly exhausting engagements involving the Black Judges. The Black Judges strongly believe that everyone is guilty of a crime against the Imperium. If no proof is found, it is either that the individual is a particularly adept at covering his devious tracks, or that the crime is only moments from being committed. Reports of missing Astartes squads in operational theatres close to Black Judges operations have aroused suspicion against them, but the Black Judges are being tolerated for the efficiency at which they break the enemies’ ability to fight back in joint campaigns… for now. Of all the mysteries surrounding the Black Judges, the most intriguing is that of their Gene Seed. Tithes have long been ignored, and with the Chapter roaming the void at will Imperial authorities have found it impossible to take the secretive Chapter to task. What few samples have been salvaged from dead Judges over the millennia suggest they descend from the line of Corax, however the variances in genetic data have led to conflicting reports ranging from the speculation of other gene-lineage to accusations of deliberately leaving dead brothers from other Chapters dressed in Black Judge colours. Of particular note is a discredited report from Inquisitor Garian Ordone, submitted in M39, claiming the genetic markers implicated the Judges as little more than heretics. The file, suppressed and hidden away, lies forgotten to all be the most resourceful of Imperial servants. Black Judges almost never remove their helms, at least in the company of others, so it is difficult to substantiate the Raven Guard lineage that is suspected with visual investigation. It is also difficult to pry the information by data-mining, as all of the oldest sources regarding the Black Judges are missing significant tracts and passages. Consensus on the matter believes it is the work of the Black Judges themselves, or agencies in league with them, that has led to such important knowledge going missing. Direct confrontation on the subject is a rare and fruitless occurrence, as every Black Judge subjected to questioning refuses to speak of the Chapter and often escapes or dies in the attempt, careful to leave as little as possible for examination post-mortem. With investigation thwarted at almost every turn, little wonder then is it that the Black Judges are swathed in rumour and enigmatic speculation. This suits the Chapter fine for they are judged on what they do, not what they are. The Angels Exultant were believed to have been created from Blood Angels gene-seed. They share the predisposition for bloodshed and close quarters fighting often seen in the sons of Sanguinius. To those familiar with the successors of that lineage however, they seemed strange. The flaw did not seem to manifest as strongly in these marines than in their forebears. Every battle group contained at least one chaplain and often several human priests whose chants in glory of the Emperor seemed to unite and direct the soldiers around him. The black rage seemed absent even though the red thirst was clearly present. The truth was far stranger. The Angels Exultant did indeed suffer from their own form of the black rage. In three ways it was different, firstly the chantings and glories to the God emperor seemed to subdue the rage enough to form a functional fighting force that had slightly more grasp at tactics than run at the enemy as quickly as possible and kill them with your chainswords. Secondly, the rage was not a permanent change but a transient one, though no one could be sure when it would end. Thirdly however was far less fortuitous, as it occurred far more frequently than even perhaps the flesh tearers. These all necessitated the training of the most zealous of recruits into the large chaplaincy at the core of the chapter. The most zealous of those who failed to pass the rigors of becoming a marine instead of being made a serf or a servitor would often be inducted into their priesthood. When they reached the Liber Cluster the Angels Exultant were quickly set upon by a renegade force. For some unknowable reason the renegades made a point of targeting the chaplains and priests of the chapter. This targeted destruction often would leave insufficient priesthoods to maintain the facade the Angels Exultant had carefully cultivated. Sometimes squads or whole battle groups would have to be destroyed from space, alongside any allies who had witnessed the devolution of those on the ground into flesh eating monsters. Greatly weakened by this enemy’s attacks, in addition to the normal losses accrued as they tried to continue in their reclamation of the Liber Cluster, the renegades finally decided to strike in force. A great space hulk tore out of the warp and opened fire on the Angels Exultant fleet. Finally though fortune smiled on the Angels. The Doomsayers came and with their aid the enemy was routed. Expressing their thanks to their timely saviors, the Angels Exultant decided to follow the enemy to their base of operations, which had been revealed via a joint boarding action of both Doomsayers and Angels Exultant battle brothers. When they arrived on the planet Arrax, the Angels found little but red sand and ancient ruins. However, searching the planet with their scanners showed that it was filled with lifesigns. Seeking to end this enemy once and for all, the entire remains of the chapter deployed all across the planet in order to quickly root out and destroy the enemy. However, the enemy had made pacts with the strange xenos that inhabited this planet.These creatures, the Sakis were essentially living sand, and thus the Angels Exultant were entirely unable to notice their presence, even directly below their feet. Meanwhile, the renegades were performing a ritual under the earth. At its height, the Sakis targeted the chaplains and priests in sacrifice to Khorne. When the ritual completed the rage surged through the Angels Exultant and hundreds of heralds of Khorne were summoned to the planet. These daemons perverted the holy chants that had once kept the raging Angels servants to the emperor into blasphemous glories to the lord of skulls. Those few Angels Exultant who had retained their sanity were quickly slain by their frothing brethren. The remaining renegades(perhaps including a member of the fallen to tie in with the Blades) came forth and took over the chants of hate as the daemons returned to the warp. They lead the Angels back onto the very ships which had brought them to the planet and flew away. They have plagued the Liber Cluster ever since, though their ultimate goals are still yet to be understood by the forces of the Imperium. Under the curse of the Black Rage, even moderated as it was, the Angels Exultant never appeared to follow the traditional behaviour of Adeptus Astartes, even for sons of Sanguinius. And indeed they were never intended to. As has been speculated, the unusual characteristics of their geneseed and resulting curses did represent an attempt to alter the legacy of the Sanguinius lineage. But unlike the theorised attempt to cure the curse in the case of the Lamenters, in the case of the Angels the unknown parties behind the chapter’s creation sought to more efficiently weaponise the Black Rage. The Black Rage is the result of the psychic legacy of Sanguinius’s death, interacting with genetic markers in the Blood Angel geneseed. The designers of the Angels Exultant sought to harness the extra strength, speed and aggression that comes upon a son of Sanguinius with the Black Rage, by moderating the biggest drawbacks associated with the condition – namely that the ferocious rage is so intense that the marine becomes incapable of following battlefield direction, and that the condition is usually permanent and an afflicted marine extremely impractical outside of actual combat. If those two drawbacks could be addressed, then the resulting chapter would be an unstoppable force. Like so many of the attempts made during the 21st Founding to alter geneseed, the attempt was not entirely successful. The careful modifications to the geneseed originally did not appear to have produced any change to the way the Black Rage manifested itself. It was when the architects considered the impact of the psychic imprint of the primarch’s death that they found the missing piece of their puzzle. Observers have noticed that unlike many other sons of Sanguinius, the Angels Exultant did not appear to make use of a librarius department. So far as anyone outside the chapter knew, they had never seen any of battle-psykers amongst the ferocious chanting hordes. The reality was much more unusual. 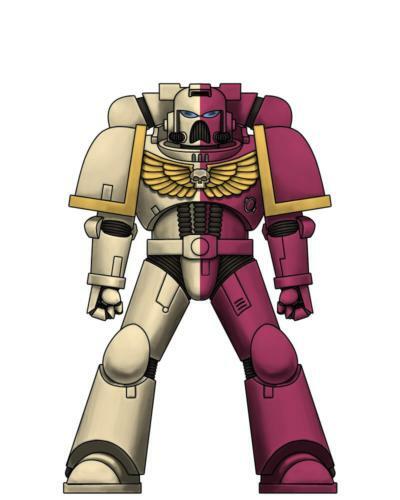 Like all of Sanguinius’s get, psychic potential runs strongly through the Angels, but has been deliberately and uniquely repurposed. The Angel Exultant geneseed enhances psychic potential, but also bends those powers in a very specific way. All marines successfully implanted gain a slight increase in their psychic strength, but most develop a specific form of psychic vampirism, where they draw psychic power from those around them. A few become much more powerful and in another chapter would become the librarians of the force. In the Angels however, they undergo unusual and highly specialised training. All of their psychic potential is trained to act as beacons of influence over their brothers. It was discovered that by projecting a psychic aura of fanatical devotion to the Emperor and the current mission, they were able to interfere with the psychic imprint that normally triggers the Black Rage and make afflicted marines more pliable. More importantly, it was also found that by producing an aura of calm and control, they could assist their brothers to regain their lucidity. It was, of course, not that simple. The ability to influence their brothers only worked effectively if the psychic receptiveness of the regular marines was further enhanced. It was discovered that the most effective way for this to occur was for a marine to “slave” themselves to one of the more powerful psykers by drinking some of their blood directly from the psyker’s veins. With their “master’s” blood resonating in their veins, they became much more receptive to the controlling aura he produced. This came at a cost. Ingesting the blood was found to almost always trigger the Black Rage immediately. After this occurred, the Black Rage would never leave the affected marine, effectively suppressed out of battle by the psyker’s aura, combined with focusing chants and willpower, but ready to reassert itself the moment these factors were removed. The marines’ psychic receptiveness meant that the chanting and willpower became more effective when done en masse. The other major cost was that the specialised training in influencing their peers constrained and limited the power and flexibility of the Angels psykers. If they ceased projecting, their chapter would fall to pieces around them. As their minds became adjusted to projecting either the enraging aura or the calming aura at all times, their psychic gifts twisted until that was the only way they could manifest their powers. Recognising that much of this would be considered suspect, the leadership of the Angels Exultant rearranged their chapter to allow them to function without arousing suspicion. The psykers were formed into a form of chaplaincy, rather than the traditional librarius. Their function was, after all, now much closer to that of a chaplain, managing the Black Rage in their chapter. It was found that surrounding themselves with human psykers, similarly trained and conditioned, made their projections much more effective again, and this became common practice. To conceal the unsavoury nature of their activities, their efforts were always portrayed as raising zealotry and burning faith, rather than psychic control. Indeed, as the practice became established and mired in greater tradition and doctrine, it’s possible that even the chaplains themselves no longer fully understood how they controlled their brothers – simply that the trained patterns of “thought” in which they were instructed worked to make their brothers functional and deadly in the Emperor’s name. Certainly, by the time they arrived and established themselves in the Liber Cluster, no-one in the Cluster suspected the true nature of the Angel’s chaplains and their ministry to their chapter. It is not known whether the traitors who engineered the downfall of the Angels knew of this potential weakness, and that was why they targeted the chaplains. Equally, it could be that the daemons of Khorne who appeared to have been involved in the downfall could detect the hated aura of psykers and directed the sources of it be exterminated. But when all of the chaplains of the chapter were executed, the Black Rage immediately reasserted itself over the vast majority of the chapter. Combined with the heightened suggestibility brought about by their geneseed and psychic imprinting, it was no wonder that they swiftly fell under the sway of the Blood God. 21st founding Chapter assigned to the Liber Cluster. The All-Seers are not a codex adherent chapter, Librarians and Chaplains fill a Major role in command decisions .The Chapter works well with other Astartes if the Emperors tarot deems it so. There have been times when they have quit in the middle of a Battle. Which has not sat well with the Inquisition, REF: Planet R390 which is now the Chapter's Home World. The Planet was given to the Chapter by the High Lords over ruling the Inquisition. Little is known on the Chapters practices and customs, what is known they were a fleet based Chapter before being assigned to permanent assignment to the Liber. Sources say the Marines are very insular and show disdain to non-Astartes. The All-Seers Armour is seen to be covered in Runes and the Wearing of skull kill totems. Every Marine is seen wearing Swords and close combat attachments on their Bolters. 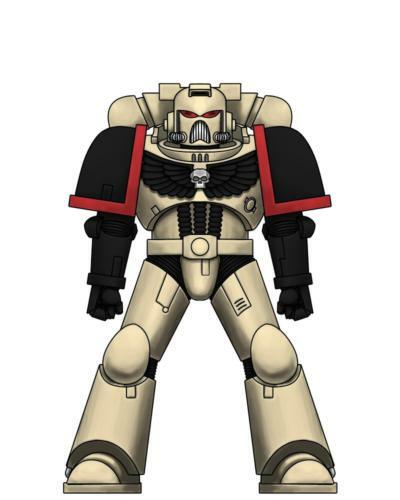 The Chapter is equipped with the most recent Marks of Power Armour, but has only enough TDA for three Squads and for High Ranking Brothers. Three Librarians and Chaplains form a Council on the direction the Chapter should take on matters of Warfare and present it to the Chapter Master their council is sage. IT is rare for him to ignore their council. Techmarines and Apothecaries roles are as in any other Chapter. The standard Company is 5 Tac, 3 Assault 2 Dev. Bikes and Landspeeders, the Tempest landspeeder is abundant. R390 was a Feral Ork planet every known trace of the Xenos was eradicated. But scouts have found traces of other Ork marks on the mountainous Continent on the far side of the planet. The All Seers are very insular in nature and do not tithe their geneseed. This is a sticking point with both the Inquisition and The Mechanicum. The All Seers care nothing for the opinions of others and keep their secrets closely guarded. Even though the Astartes Chapters of the Liber Cluster are said to all be from loyalist stock that has not gone through any tampering like many of the other ill fated 21st founding Chapters, it is suspected in some circles that origins of The All Seers are dubious in nature. Whatever the truth is The All Seers are not saying. To this end, a certain Hereticus Inquisitor by the name of Javier DuMonde has made it his mission to discover their true nature. It is his belief that The All Seers have turned from face of The Emperor and are now on a road to damnation. So far all of his attempts to learn the truth have come to nothing or have been thwarted by the Chapter. What he does know is that they seem to be on a quest to find something. Being a Chapter that is led by their Librarium, The All Seers draw suspicion from many of the other Astartes Chapters in the Liber Cluster. This is not lost on the Chapter but it is of little importance. They view their role in The Liber Cluster as one of utmost importance. The Chapter's Librarians all possess the power of precognition and it is this ability that is used to guide its actions. Upon coming to the Liber Cluster, Chief Librarian Galron "The Mystic" became struck with a vision. After locking himself in his quarters for three days he emerged with the direction the Chapter was to take. his visions told him of a priceless relic and an ancient alien evil that lay dormant on the Western fringe of The Cluster. Since then several other members of the Librarium have had similar visions sometimes even in the midst of battle. These premonitions are taken very seriously and have caused The All Seers to on occassion withdraw from an engagement or refuse participation. This has caused them to draw the ire of many. Working closely with Librarium, the Chaplains are ever vigilant to have their finger on the pulse of the Chapter. Some Battle Brothers have a hard time coming to grips with what many see as an oftentimes deriliction of duty. It is at these times that the Chaplains will counsel the Marines by assuring them that the All Seers have a duty to The Emperor that takes precedence above all and that duty is to find the meaning of the Librarium's prognostications and to locate the Relic. Because to do so will mean the salvation of the entire Liber Cluster. The Doomsayers Space Marine chapter came to the Liber Cluster chasing Renegades who sought to elude them. What the Renegades were unaware of, was that the Doomsayers were masters of void warfare, a heavy preference laid upon it over other forms of fighting. They were hunted down and utterly annihilated, but being a suspicious sort, the Doomsayers remained in case there were more. As with most naval warfare, boarding actions also must occur, and the Doomsayers do not shy away from becoming personal with their enemies. Boarding shields are a favourite tool amongst many of the brothers, and the shieldwalling of corridors is a popular tactic in denying the enemy. The first company maintains a few suits of Terminator armour, which are utilised primarily for the boarding of capitol ships. Such priceless relics should only be used when there is much honour to be won. The Doomsayers were given the planet of Ushion VII as its Home World and Domain of the said Worlds in the Aquarii Cluster in Ultima Segmentum. While on a full Chapter deployment along with the Ultramarines, Marines Errant against Large Incursion of Orks from Charadon Sector, They recieved a distress call from Ushion Vll. Upon entering the system from the warp the Navigators and Librarians fell Unconscious from 20 billion Souls screaming from the Warp. Further in system the Fleet encountered the remains of their Home World. Further investigation on one of defense platforms the cause. Left on the chest of one of the few Brothers left to watch over the Home World impaled with the Brothers Power Sword was a Pauldron of the Crystal Skulls a former allie of the Doomsayers that turned Renegade. With the destruction of their Home World the Doomsayers have become a Fleet based Chapter.After years of Searching for the Renegades they finally caught up with the renegades entering the Libre Cluster.Engaging the Renegades ship to ship the Doomsayers superioity in numbers assured victory, With the Crystal Skulls force all but destroyed . CM Kaunaz and the Terminator Elite Teleported to the last Crystal Skulls ship. 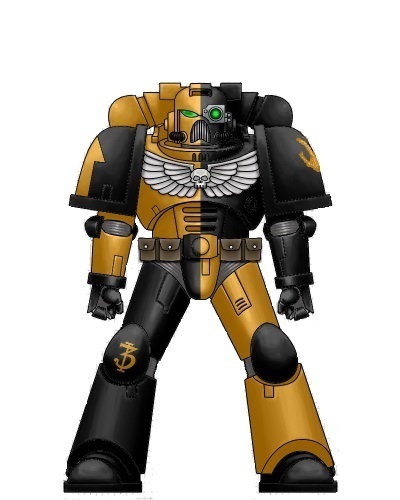 Since the destruction of their Home World the Doomsayers have become a Space bound Chapter.In the years that followed they have become the Masters of Navel and Void Warfare.Sternguard Vanguard Squads wear suits of Void harden Armour. While specialist Squads in each Company also have The Harden Armour along with Boarding Shields. Beside Boarding Torpedos they have Caestus Assualt Rams and the Vaunted Thunderhawk Gunships and various other classes of Astartes Aircraft. At this time the size of the Doomsayers fleet is unknown. At entering the Cluster 4 Companys are present. The rest are presently in route. The Doomsayers follow Standard Codex Tactics for planetary assualts and such. But it is Brutal face to face Boarding Action that Doomsayers Crave. The Doomsayers Geneseed appears to be stable,but for a slight defect in the Catalepsean which makes it impossible for true sleep.That could be the possible reason for The Doomsayers to a Morse & Moody lot. The Doomsayers direct lineage to the Ultramarines could be placed in doubt given their mood they seem more to be a direct link to the Doom Warriors.Also Sons of Guilliman. With the Destruction of their Fortress Monastery and Home World it is unknown how much Geneseed they have or when they last tithed any to the Mechainum. The Black Falcons are a Chapter on the brink. On arrival to their home system they were set upon by a large fleet of Ork pirates. After a prolonged space battle, which saw many ship to ship boarding actions by both sides, they were victorious and the Ork fleet was scattered. But victory came at a great cost as the Black Falcons were reduced to below half strength. Many of the original command structure was lost as well as most of the veteran 1st Company. The reeling Chapter was resolute and vowed to rebuild in the face of overwhelming odds. The Black Falcons are scions of Corax descended from the Revilers. As such they excel in stealth and hit and run tactics. They also practice the rapid insertion form of warfare that is used by their progenitors. This became instrumental in helping them rebuild as they were able to minimize their losses during any engagement in which they participated. 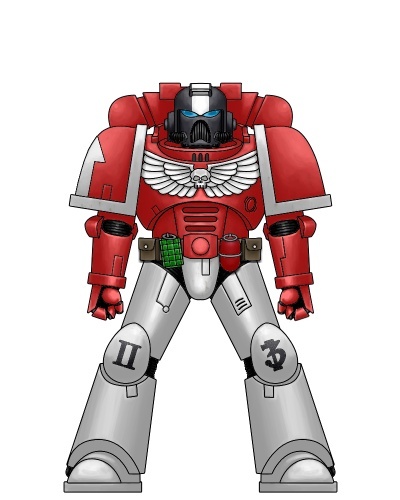 It did not help their relations with Codex-compliant Chapters such as The Lords Inviolate and the Scarlet Sentinels who look upon their style of warfare with disdain. They have a particularly strong relationship with The Eagles of Glory. This is due to assistance given by them in the form of equipment and supplies during the early stages of the Black Falcon's rebuilding process. And on more than one occasion Black Falcons squads that had spent weeks behind enemy lines were able to complete their missions due to the timely application of overwhelming firepower by The Eagles of Glory. The Black Falcons have not forgotten this and work with them whenever possible. The Black Falcons are now at around three quarter strength. They still maintain the style of battle favored by their genesires. They have a relatively good relationship with the Saneslau Mechanicum and have assisted them in recovering equipment and materials lost during the first colonization of the Liber Cluster. The 4th Company under the command of Captain Samuel Therrien are currently investigating reports of cult activity in the nearby Thravian System. Contact was lost and the Chapter has sent elements of the 1st and 6th to ascertain their status. Due to recent losses of manpower but the support of the Eagles of Glory in the form of war material, the Black Falcons have reorganized their companies significantly from standard codex compliance. Thanks to the Eagles’ support, the Black Falcons are very well armed, even though they have few veterans. This has led to the allowance of non veterans to use tactical dreadnought armour in combat and the formation of a tank company. The few remaining members of the first company have been split up amongst the 8 companies the Black Falcons now maintain. The 2nd through 6th companies that make up the 5 battle companies now include 3 scout squads, 3 assault squads, 3 tactical squads, and 1 devastator squad. The 1st company contains 3 Terminator squads, 5 devastator squads, and 2 assault squads often heavily armed. The 7th company is a tank company consisting of roughly 50 space marines including the chapter’s techmarines. The 8th company is a scout company and functions similarly to the 10th company of many more conventional chapters. The 1st and 7th companies are often fielded separately and dispersed amongst the 5 battle companies, but some occasions warrant their deployment on the battlefield as a unit. One such occasion saw the 7th company fielded alone as a unit of razorbacks, vindicators, and predators storming across the fields of Parcath through a series of Necron fortifications. This event earned them the moniker of the “Linebreaker” company. The large number of recruits the chapter has needed to take in during such a short period of time has resulted in several aspects of Scythian culture working their way into the chapter. Foremost perhaps, the Emperor is often referred to as the Sky King, even though all the recruits are taught the ‘truth’ about him. Furthermore, the newest Black Falcons have taken to wearing the ruined xenos tech and knives used in their recruitment as talismans. They are often affixed to armour as a ward against alien interference. These changes have lead to a division between the older marines and the new. So far this division has not lead to many difficulties, but as the percentage of battle brothers subscribing to the new belief structure increases, it remains to be seen whether these differences will strengthen the chapter through flexibility or weaken it through infighting. Proud sons of Jaghatai Khan, the Heralds of Letum were created during the 21st Founding. Although initially intended for Segementum Tempestus, the Chapter was accidentally assigned to the Liber Cluster expedition through a simple clerical error. The scribe responsible was executed for his incompetence, but by then the fleet had long since left. The Chapter chose their name upon taking the world of Libitum as their home world. The feral natives clash with each other over resources in their underground settlements, and as worship of their version of the Emperor, the death god Letum. The Heralds view themselves as angels of their god, and will go to great lengths to slay enemies of the Imperium. The Chapter refuses to recruit psykers or fight alongside them. Instead the Heralds have the office of the Bone-Seers, Chaplain-mystics who maintain Chapter records and often resolve important decisions through reading bones for the answer. The bones used are always from proud heroes of the Chapter who still guide the Heralds in death. The Bone-Seers also maintain records of foes the Chapter has fought, with notes on successful tactics against those enemies. The contents of these records are often debated amongst the Chapter’s Captains, and occasionally improved upon. Like their parent Chapter, the White Scars, the Heralds of Letum favor lightning assaults. Unlike the White Scars, the Heralds’ armoury is almost exclusively composed of aircraft, which spearhead all of their campaigns. The Chapter maintains a small number of tanks, which are only deployed when needed. The Heralds of Letum prefer to fight alone, often refusing the aid of others. This has led to tense relations with the Eagles of Glory, whose almost constant offers of aid irritate the Heralds greatly. The Heralds rarely attend the Liberite Conclave, though when they do it is often to deliver important information to the Conclave. Such was the case when the Heralds brought news of the approach of Waaagh! Guznat, which saved many Imperial worlds. The Heralds of Letum regularly send strike forces into the darker corners of the Liber Cluster. The Chapter has slain many possible threats before they could endanger the Liber Primus Sub-Sector. It is believed that several uninhabited worlds the reclamation fleets have encountered are the work of the Heralds of Letum. The Heralds do not care if their actions are recognised, only that they do the Emperor’s work. So will the remaining Liberite chapters have to have a full write up in the Libre? I have had this Chapter sitting on the backlog since 1990.But have very little written up on them. I suspect a full-on article will be a bit much for something of this scope. Just follow Cormac's examples - a brief overview of four paragraphs should do for now, considering this is just out of the gate. Aye, Olisredan has the right of it as far as article write-ups are concerned. I intended to post some guidelines once the Chapter that will helm the Liberites is chosen, in a week's time. My write-ups for those two are just over 500 words each, and I thought that putting a 500 word minimum soft limit would do nicely. It wouldn't be anything that those of us who frequent the Liber would sweat over, but it would be enough to show some definite character of the Chapters, while also leaving plenty of room for the Chapters to grow under the hands of our brother Liberites. One, what I ultimately want to see in this thread is a group of people challenging themselves in the making of new ideas. Often what you see here in this subforum are people who have been silently tinkering away at their ideas, posting them onto the subforum only when they have achieved something that they feel is noteworthy. Which is great and fine and all that. I'm doing that with all of my own DIYs, in fact. This project offers us the opportunity to break from that, and have fun with something fresh and new. Something that might not even be of our own minds, but someone else's. Two, using something that already exists as "your idea" gives us a sense of entitlement and ownership. My Emerald Tigers are mine. While I might be alright with someone else playing around with a Chapter of the same name, or even straight up using the Chapter I created, it remains in my mind as mine. If they do well with it, I'll cheer. If they do poorly with it, I'll pretend it didn't happen. It's natural, and there's nothing wrong with it. But again, this project intends to challenge that. Anything that is submitted to the Project and is included in the Project, belongs to the Project and by extension the Liber Astartes subforum and the entire B&C. Something you contribute, could be completely different than how you intended it by the end of this, thanks to others' contributions to it. I need for people to be accepting of that, and for some that might mean contributing something they don't have a prior attachment to. I like the Lords Inviolate, stern yet not jerks for the sake of being jerks. With the cluster being separated from the galaxy and the Imperium's usual structures I don't think its out of the question that a chapter would have a bit more influence than usual. I like the Sons of Calderon, but I think the Lords Inviolate would be the ideal leaders for the Liberite Chapters. It would be cool if the Sons of Calderon could be kept as well, as they are pretty unique. I think the Lords Inviolate would probably achieve their status as first among equals of the Liber Cluster through circumstance and maybe calling for a conclave (the Liber Conclave?) of Chapter Masters at some point early on. Y'know, showing some initiative. Durant - Once a naval port of call, Durant is now little more than a waystation frequented by mercenaries and scum alike. The mutants that live on the moon of Durant, Charis, are regularly culled or hunted by slavers. They are afforded no rights as citizens of the Liber Cluster. Durant itself is a warren of tunnels and supply caverns, the spaceport serving as more of a settlement these days than an actual military facility. The planet may be small but should you need a hired gun, there is plenty to find here. Edited by Olisredan, 21 June 2014 - 10:03 AM. Hmm, this looks pretty interesting so far. I can't decide between the Lords Inviolate or the Sons of Calderon. On the one hand the Lords Inviolate sound really cool, but on the other hand I really like the turquoise 'n' grey and unorthodox independence of the SoC. I'd agree that we shouldn't just scrap whichever chapter doesn't make it - there's a lot of potential in both! I like the Sons of Calderon,Can even see some Volkite weapons showing up. It might have been nice if the cluster had been settled by Nova Terrans, even. I was eager to participate until I read that the creator needs to relinquish all rights to their contributions. Why would anyone create something that anyone else would then be able to profit from it, either monetary or otherwise. Are you referring to artwork? Everything you share on the B&C becomes public domain simply by dint of you posting it. As this isn't a site founded on original work, there aren't any inherent copyrights on what you post. If someone thought (for some strange reason) they could take one of my Chapters and create a Black Library novel out of it, there's not much I could do, because I posted it here. That being said, do honestly think someone here is going to try something like that? If they're creative enough to take a 5 page Liber Article full of holes and profit from it, they didn't need our help in the first place. Additionally, this is community creative effort. You won't be creating everything and turning it over. You're helping create something in collaboration with everyone else. Edited by Messor, 21 June 2014 - 10:55 PM. Considering there is nothing else that you could be referring to. This rule, to me, appears to to cover the whole 'public domain' thing that Messor spoke of. It's there to remind you, me and all other potential contributors that things in this project are being done for the community, not the individual. In one sense it's about creating a contained bubble within the 40k universe (and the Liber) that can be looked back upon and enjoyed as a whole without the worry that there could be other threads to chase up. How exactly someone is supposed to 'profit' from this is a good question - but if you strongly feel that your intellectual rights are in danger by participating, the answer simply is to not take part. Now, the fact you posted here speaking your concerns can mean one thing, I think - that you are seeking reassurance that no funny business is going on. To my knowledge, this is all above board. If you need further proof, I can only offer you to PM me and Cormac for any candid questions you feel necessary. Edited by Olisredan, 22 June 2014 - 12:02 AM. Both Chapters are well thought out and a strong basis ! 2) I don't know how fluffy it is because Black Templars geneseed is actually Imperial Fist, but I don't care and a Black Templar successor Chapter is awesome, period. I like both chapters, and think they should both be retained in the Cluster. In terms of who are the 'leaders', my vote would be the Lords Inviolate. A more logical fit and a chapter that would be more likely to entrusted with such a responsibility. I pledge my vote towards the Sons of Calderon. 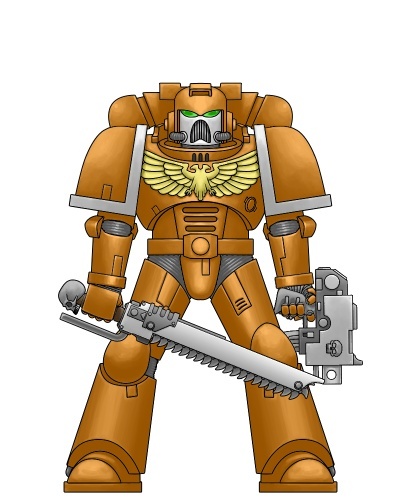 I really prefer a son of Dorn over a son of Guilliman anyday. I also really like the idea that they have close ties to the Mechanicum, it's a great twist to have on an Astartes chapter. While they may not be the natural born leaders the Lords Inviolate are, they still present a good possibility of being the leaders the Liber Cluster needs. They also bring the better method of advancment to the table. They assist the Mechanicum in finding lost tech, which could lead to new weapons and vehicles or improved means for creating astartes. Like I said, they may not be the natural leaders, but to me they provide much more then the Lords Inviolate do, so for me they're the obvious choice. While they may not be the natural born leaders the Lords Inviolate are, they still present a good possibility of being the leaders the Liber Cluster needs. They're not the Leaders the Liber Sector deserves, but they're the ones it needs right now ! The Lords Inviolate sound like they would be better to lead. Cormac Airt, do you have Word? I like the Sons but would prefer to see both chapters involved or even more than 2 .